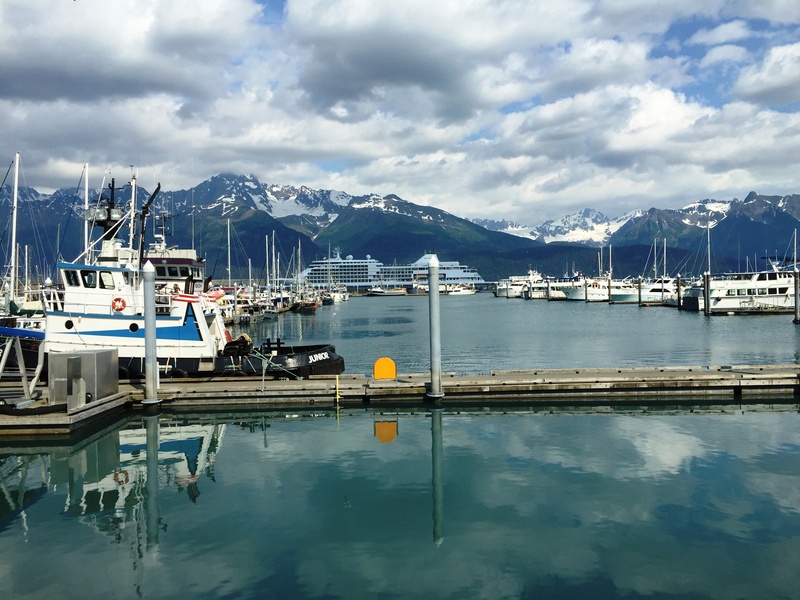 Our days in Alaska were going quickly and it was soon time for the last segment of the trip – Barrow, the northernmost city in the US. 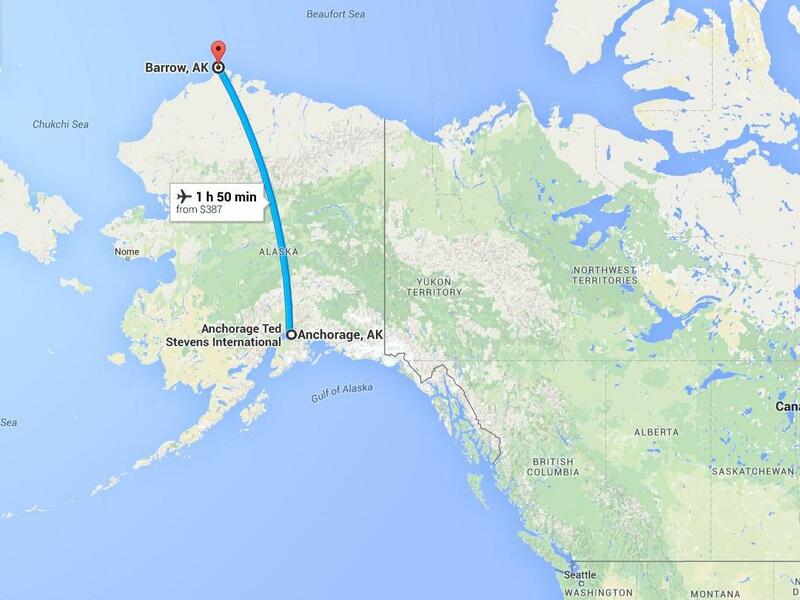 Barrow is about 350 miles north of the Arctic Circle and roughly 1,300 miles south of the North Pole. As you might expect, it was cold, and windy too, so we were often chilly even in our warmest winter wear. 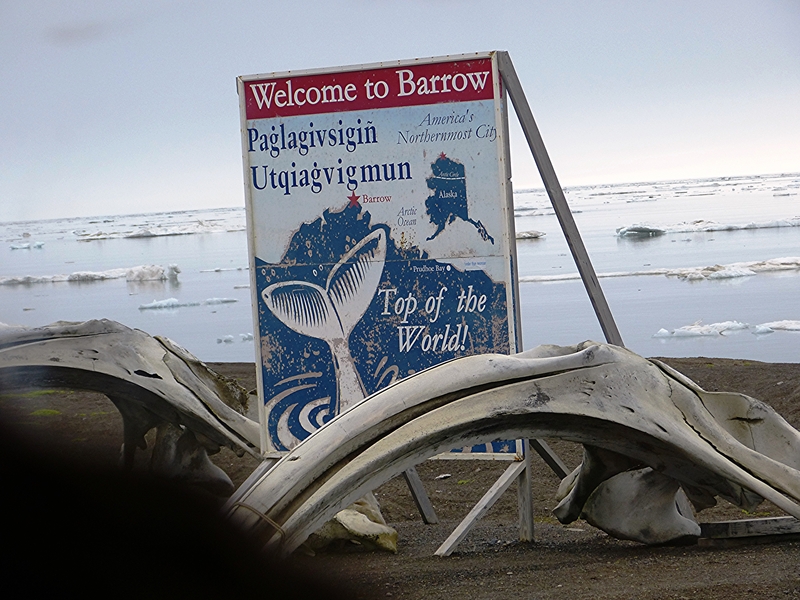 Barrow is small with a population of about 4,400; approximately 61 percent are Iñupiat Eskimo. Like Nome, no roads connect it to any other city in Alaska. 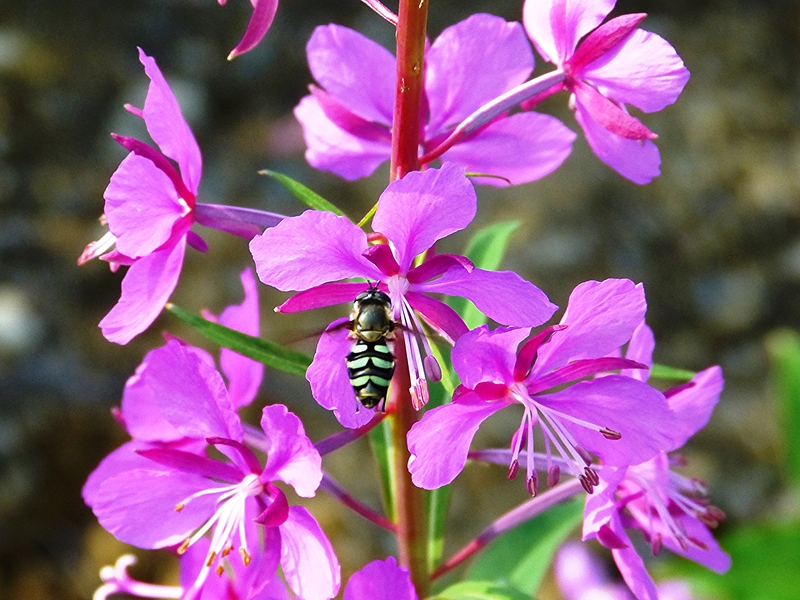 Our flight from Anchorage on June 25 arrived in the early afternoon and we checked into the Airport Inn hotel. We started seeing birds before we even got on the bus to go birding. A Snowy Owl was perched on a tall pole just down the street from the hotel. 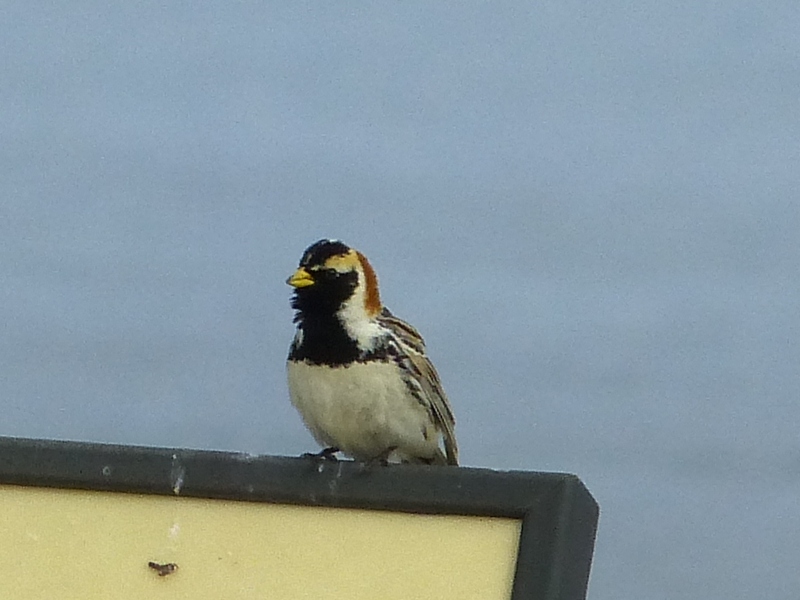 Snow Buntings were nesting in a box attached to the side of the house across the street. We learned that these nest boxes are common because Snow Buntings are thought to bring good luck. 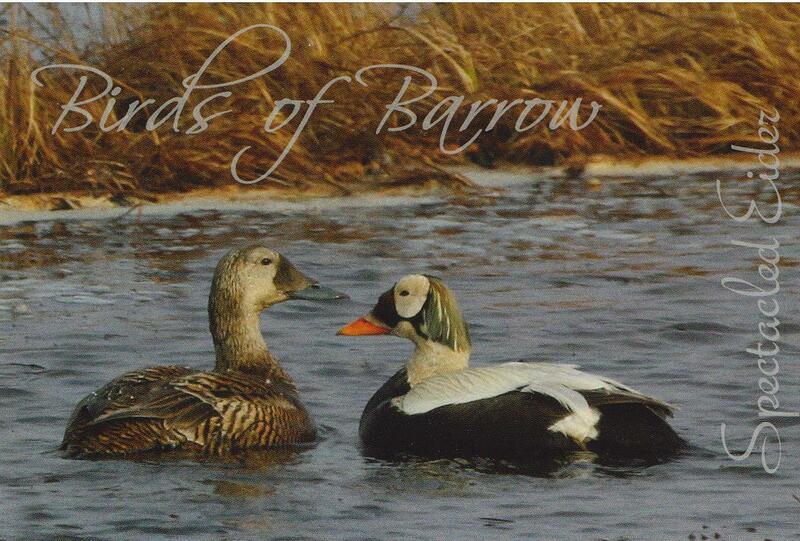 Our main targets in Barrow were eiders (sea ducks) with all four of the world’s eider species breeding there. For many birders, Spectacled Eider is the holy grail of waterfowl. 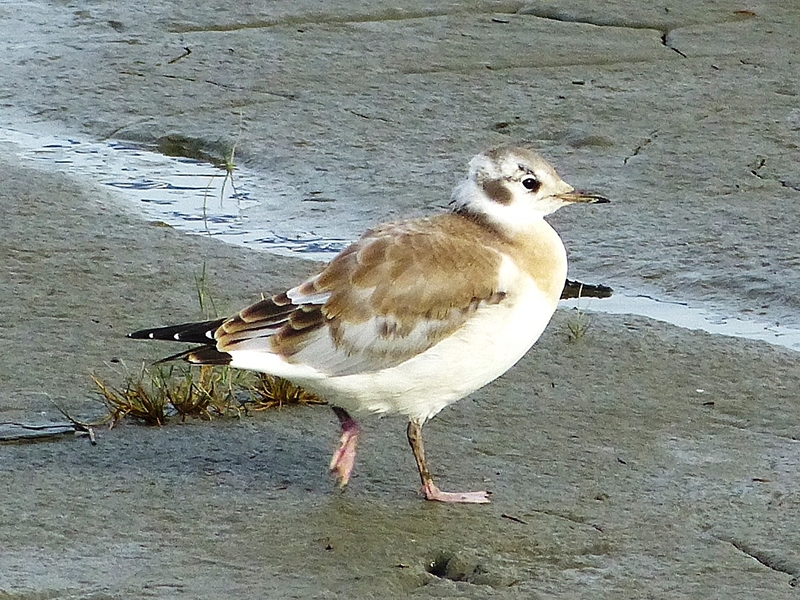 And, we did see them, although we had only distant scope views. I did not get a photo, but here is Cindy Shults’ postcard. More about Cindy later in this story. 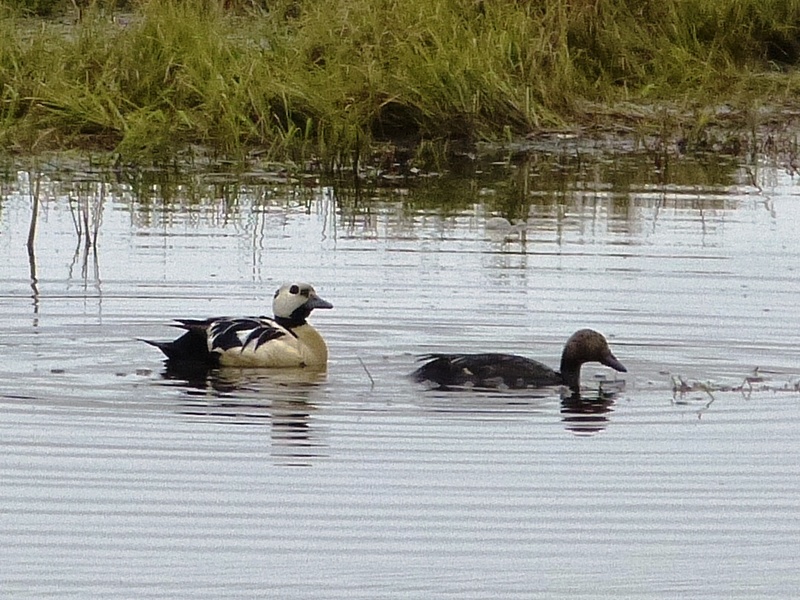 The most beautiful duck turned out to be Steller’s Eider and we did get good looks at several pair of this species. 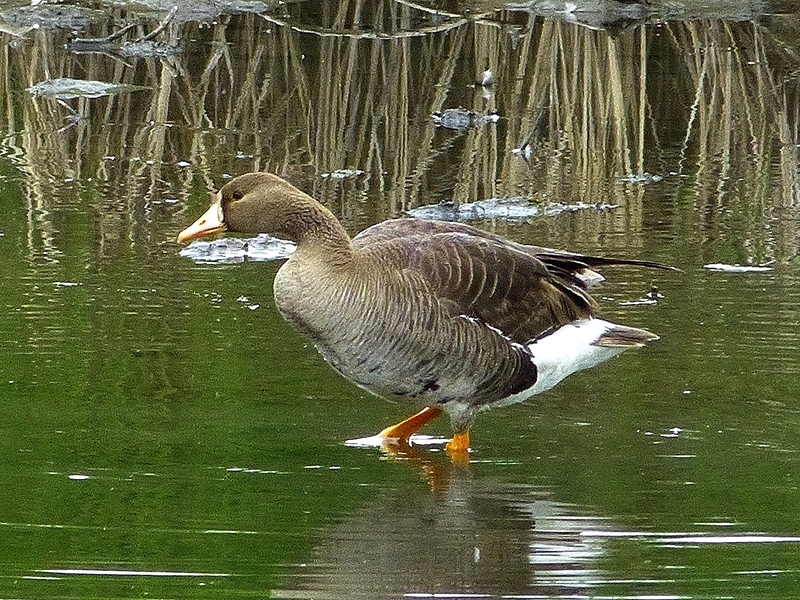 On all of Bill Drummond’s trips, he has everyone vote for their top five birds using whatever criteria they choose. Steller’s Eider was voted the top bird for our Alaska trip with Spectacled Eider coming in second. We also saw our first Red Phalaropes of the trip, life birds for me. Just like the Red-necked Phalaropes that we saw earlier in the trip, the females are more brightly colored than the males. 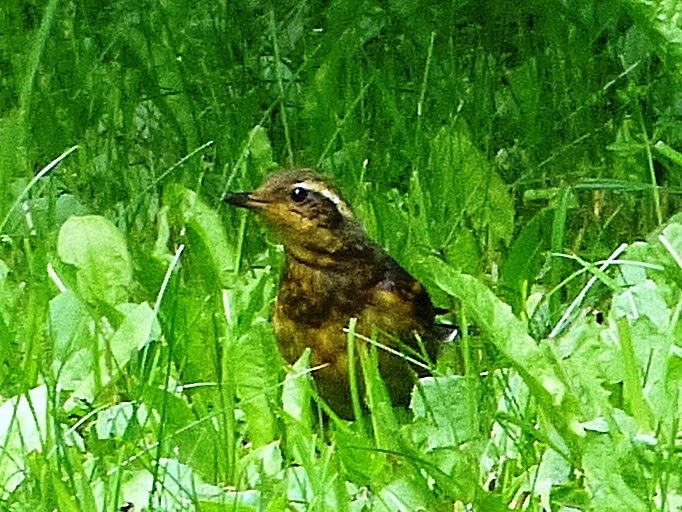 “The note is deep, hollow, and resonant, but at the same time liquid and musical, and may be represented by a repetition of the syllables too-u, too-u, too-u, too-u, too-u.” The full text of this short article can be found here Pectoral Sandpiper. 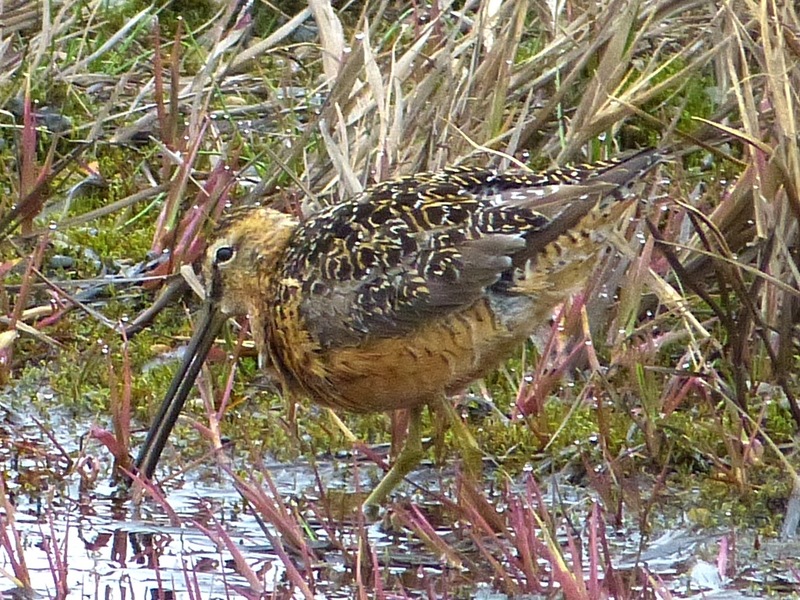 Another bird that I really enjoyed seeing in Barrow was Long-billed Dowitcher. While most of the others were scoping distant birds on the water, I enjoyed some quality time with the phalaropes and this bird. I had never seen a Long-billed Dowitcher at such close range and I usually see dowitchers in winter plumage rather than breeding plumage. Additionally, there was no chance of mistaken identification because the very similar Short-billed Dowitcher does not range as far north as Barrow. 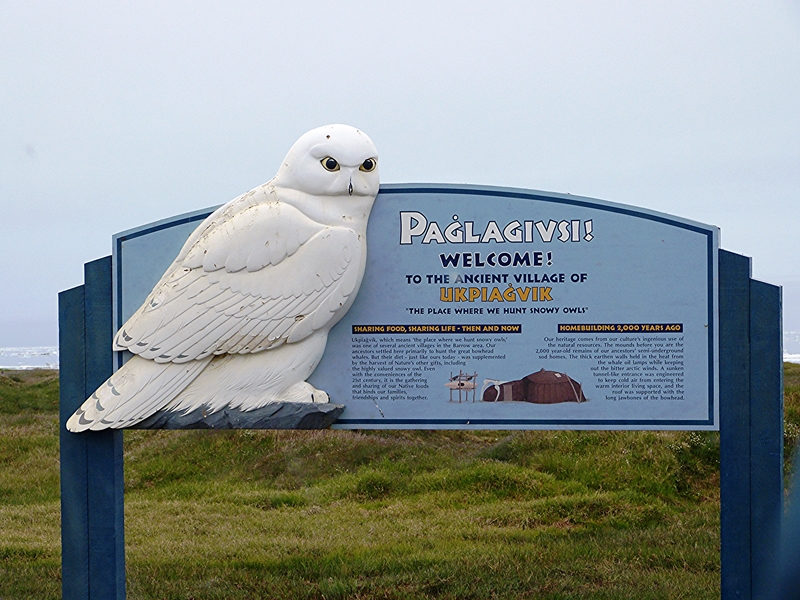 The Barrow community is traditionally known as Ukpeagvik, “place where snowy owls are hunted.” This words on this sign surprised me a little, but it was a stark reminder of the challenges of life in the far north. Everyone is just trying to find enough food to survive. I enjoyed more quality time with a few special birds again on our second day. 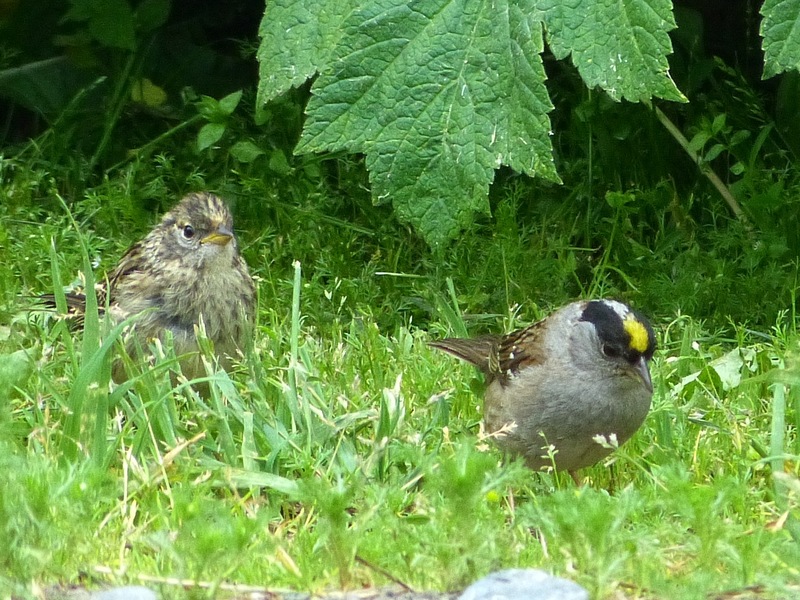 In Barrow, these birds were as common as robins and chickadees are at home, but I had no idea when or if I would ever see them again. 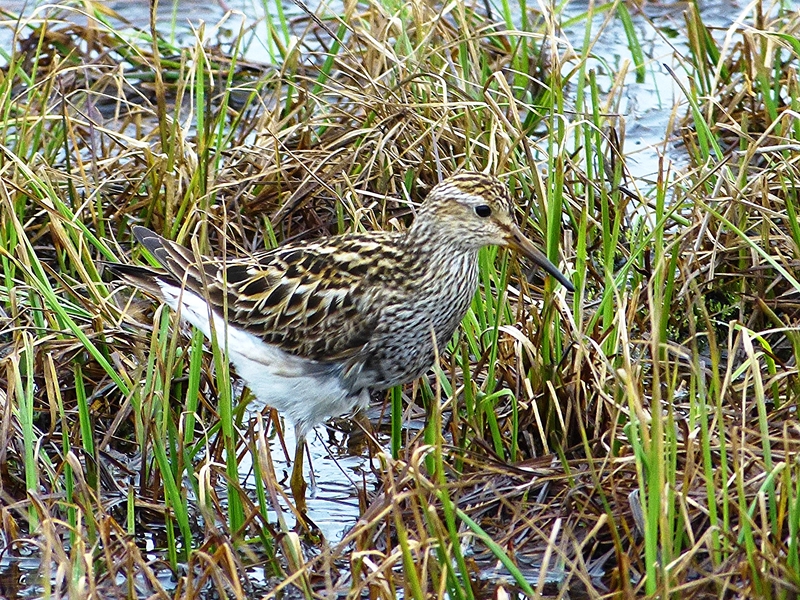 The two birds below were seen from a long boardwalk out over the tundra along with a Semipalmated Sandpiper on her nest and a female Pectoral Sandpiper. A sea watch was the plan for our last morning and I almost didn’t go thinking that all the birds would be out so far that I couldn’t see them. But, this morning turned out to be a wonderful end to our stay in Barrow. On our way to the ocean we stumbled into Cindy Shults’ yard, the only one that we saw in Barrow with bird feeders. 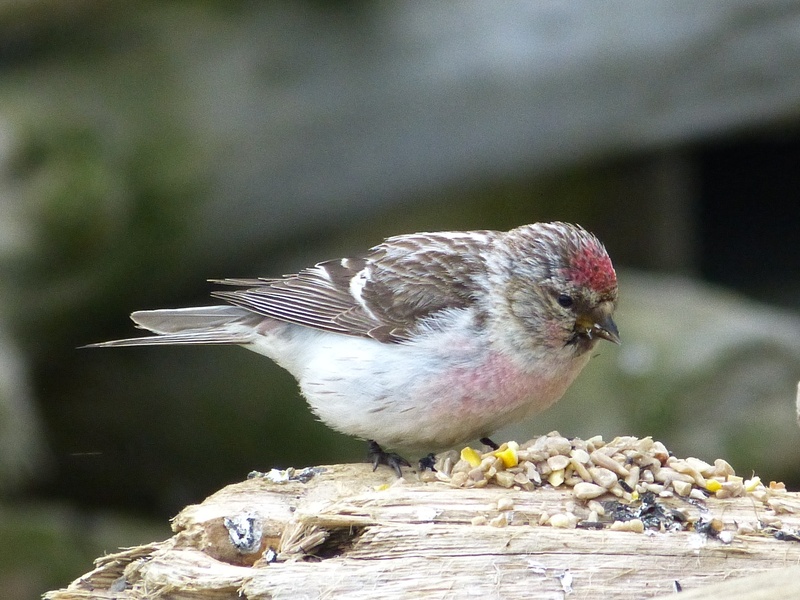 The yard itself was interesting and we enjoyed the birds including several Hoary Redpolls, a just fledged Snow Bunting, and an unexpected Pine Siskin, which is rare that far north. 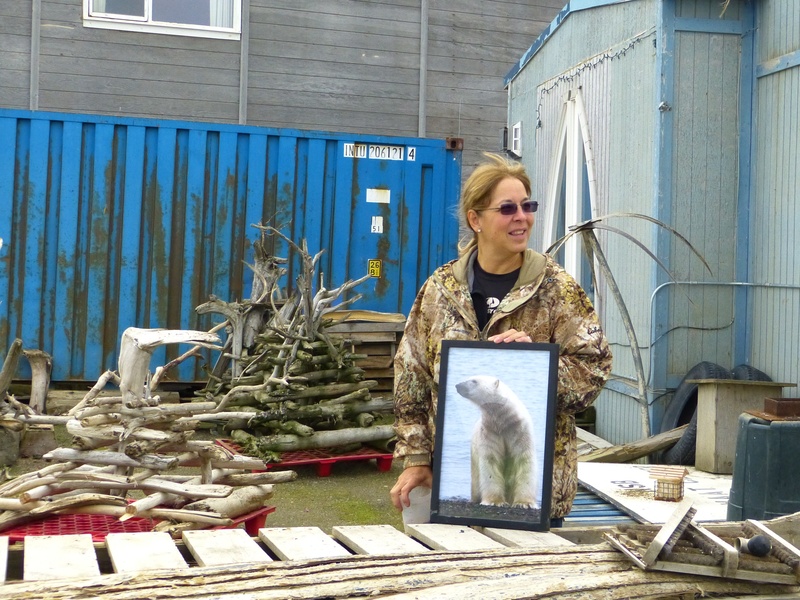 Cindy came out to talk with us and we thoroughly enjoyed meeting her and talking about life in Barrow. Cindy is a freelance photographer who owns Windows to the World Photography. She was also the manager of the Barrow Job Center until recently when the job center was closed. After visiting with Cindy and her birds, we tore ourselves away and went to watch for sea birds. That turned out to be more fun than I’d expected. 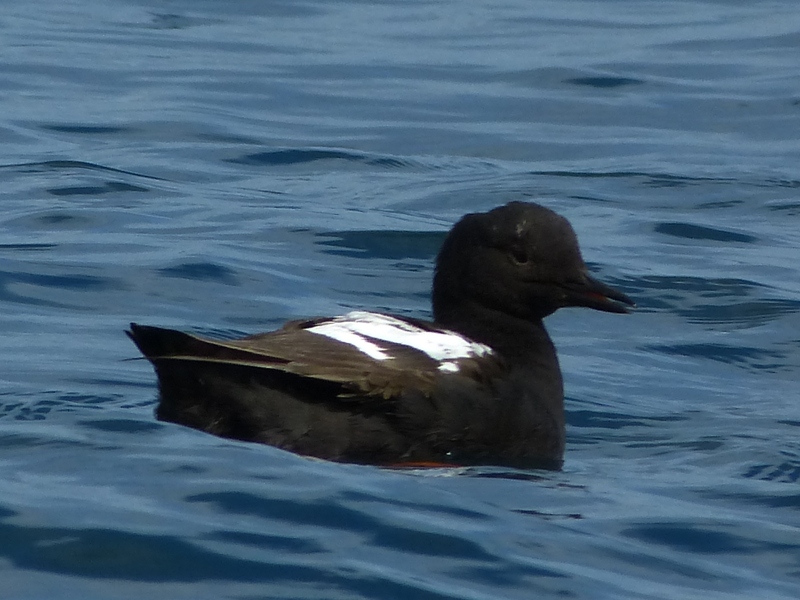 I did see birds and I learned how to identify White-winged Scoter and Black Guillemot at a great distance. We also had fun talking with a young man who had recently graduated from high school. 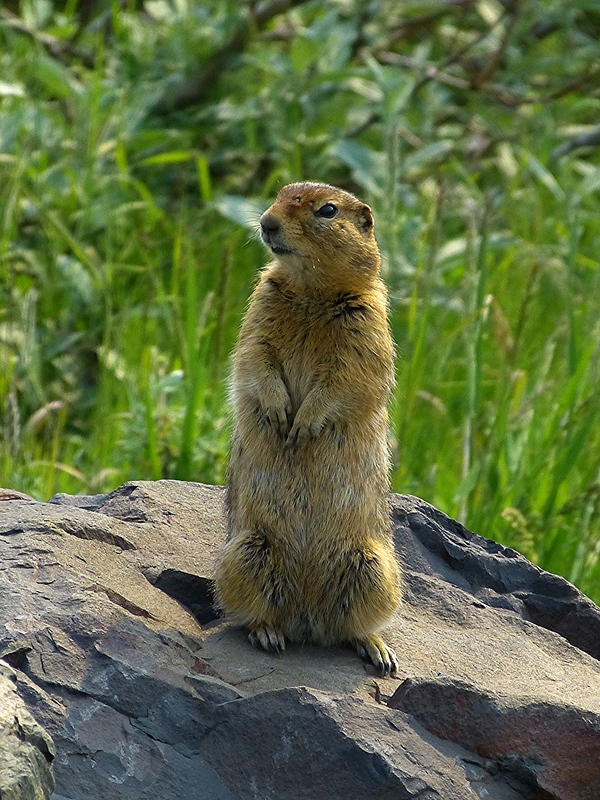 We think that his friends dared him to come talk to us, but he seemed genuinely interested in what we were doing. He was very personable and smart and he shared his dreams of going to college elsewhere and then returning to Barrow. Soon, it was time to catch our plane back to Anchorage. We packed up and said goodbye to our new friends, Andrew and Nancy, managers of the Airport Inn. They hope to buy the hotel and we joked about how it would help business if we returned in February and brought friends with us. The Pribilof Islands host more than 2.5 million nesting seabirds each year, mostly on St. George, which has the largest seabird colony in the Northern Hemisphere. But fog makes travel to St. George unpredictable with frequent delays and cancelled flights. 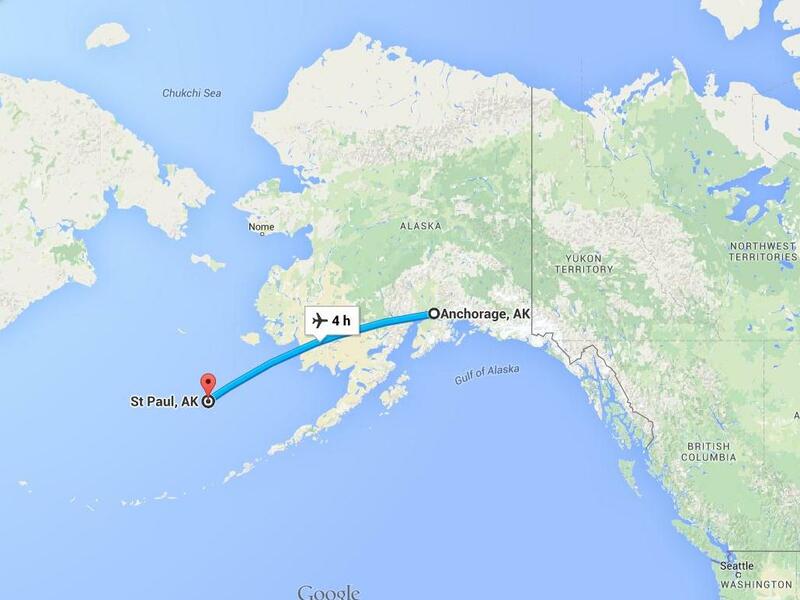 So, after our return from Nome, we flew to St. Paul Island on June 14th. 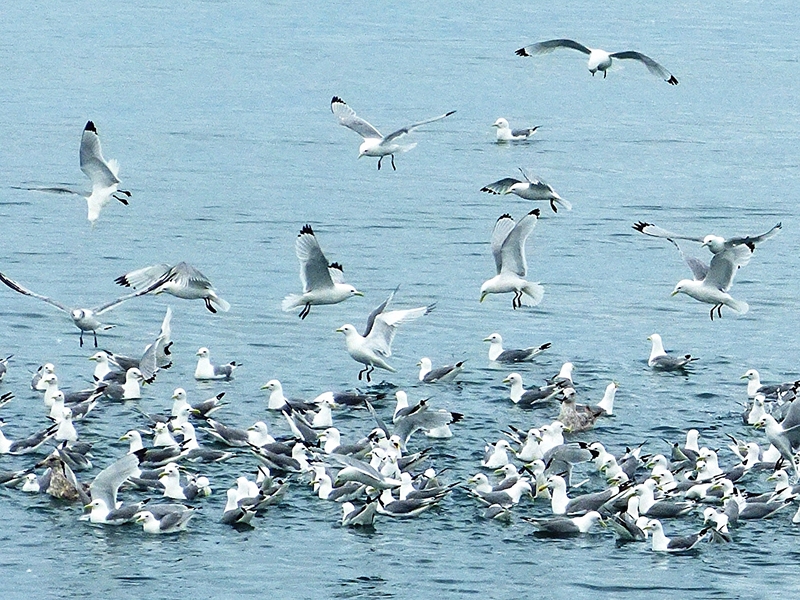 The island has a human population of about 500 and an avian population of nearly 200,000 in late spring. 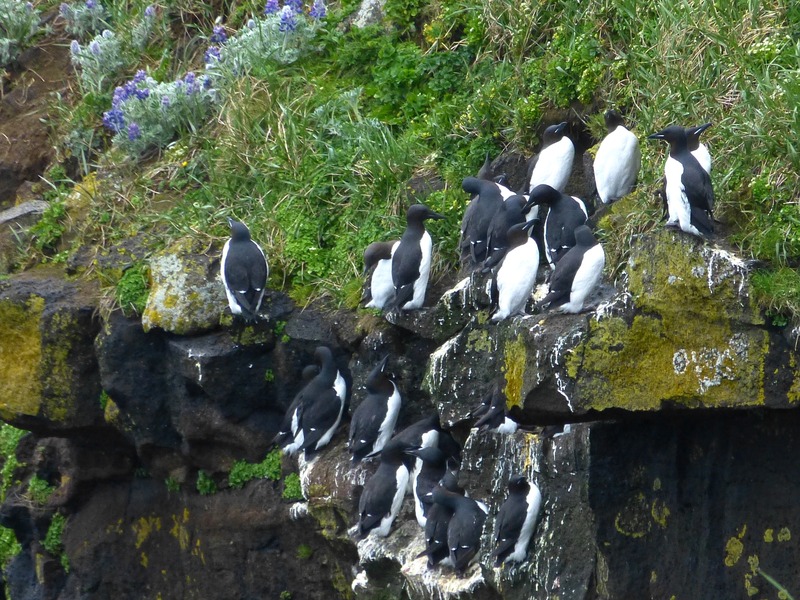 The regular breeding seabirds of St. Paul include about a dozen species of murres, auklets, kittiwakes, puffins, Red-faced Cormorant, and Northern Fulmar. 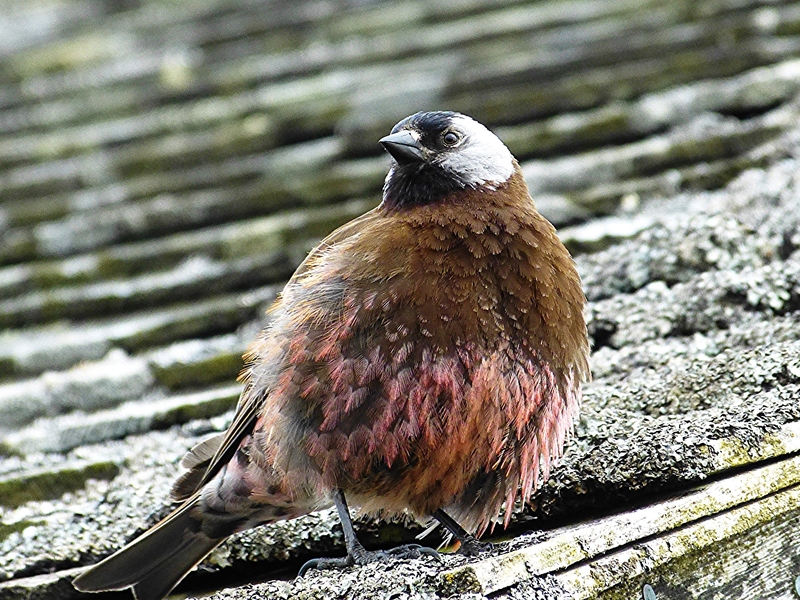 Close-up views of these birds are enough to delight any birder. In addition, Siberian vagrants predictably show up on St. Paul. Predictable does not mean that you have any idea which rare birds will show up; just that it is very likely that something unusual will appear on the island during any week in spring. 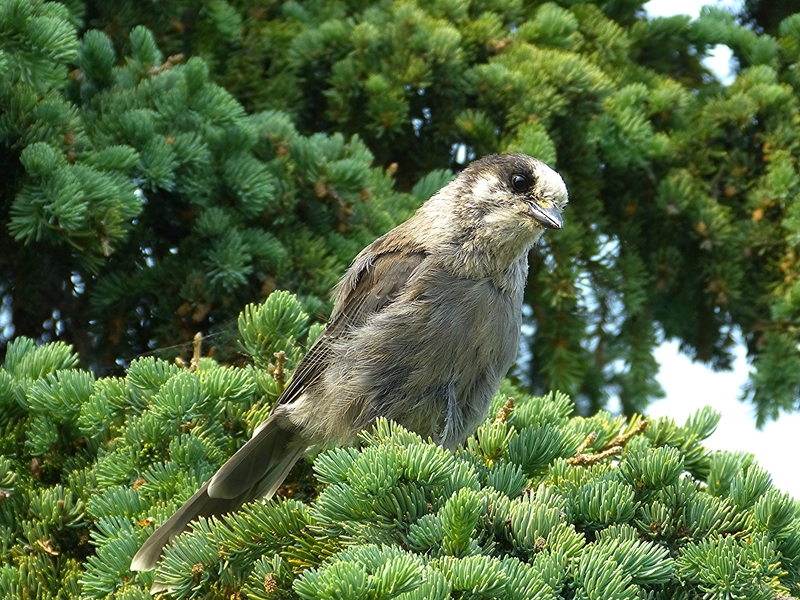 The birding routine on St. Paul is the same for everyone. 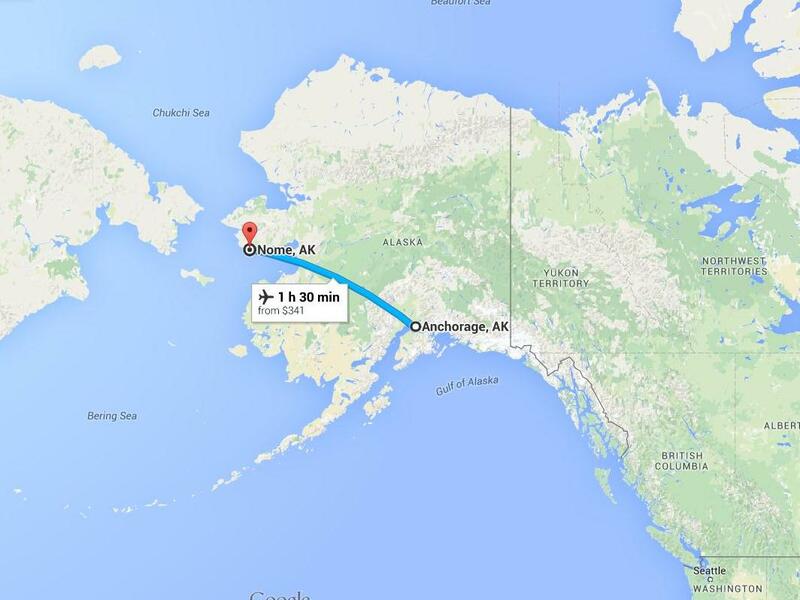 You fly from Anchorage on Pen Air, the only airline that serves St. Paul and St. George Islands. 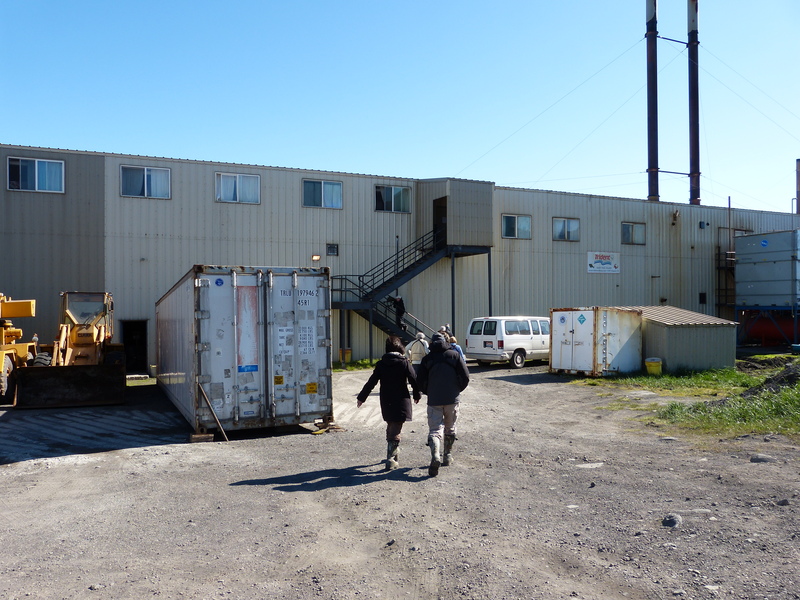 You stay at the King Eider Hotel, the only hotel on the island, and eat at the Trident Seafoods cafeteria, where the folks from The Deadliest Catch also eat. The hotel is basic, but comfortable. Each room has a double bed or two twin beds and the bathrooms are down the hall. The food at the cafeteria is very good. 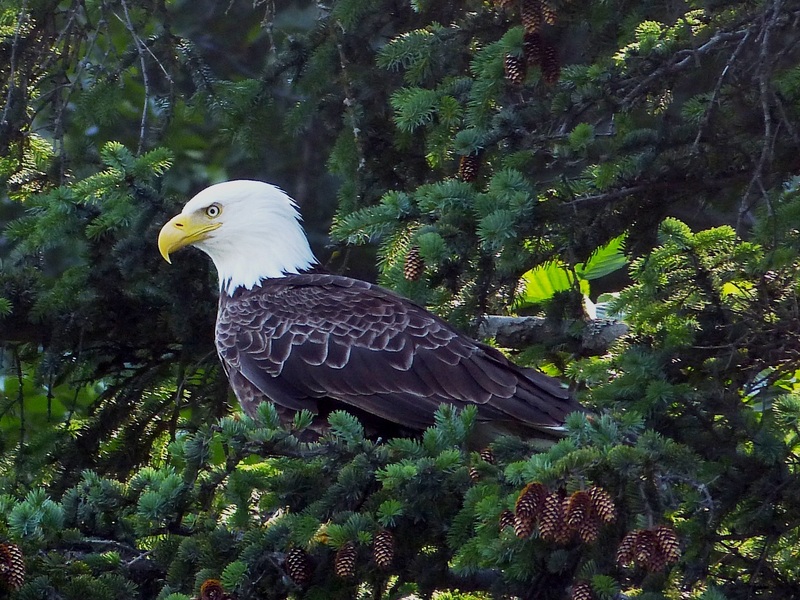 The Alaska Native corporation, TDX, owns over 95% of St. Paul Island, including St. Paul Island Tours, which employs the birding guides. 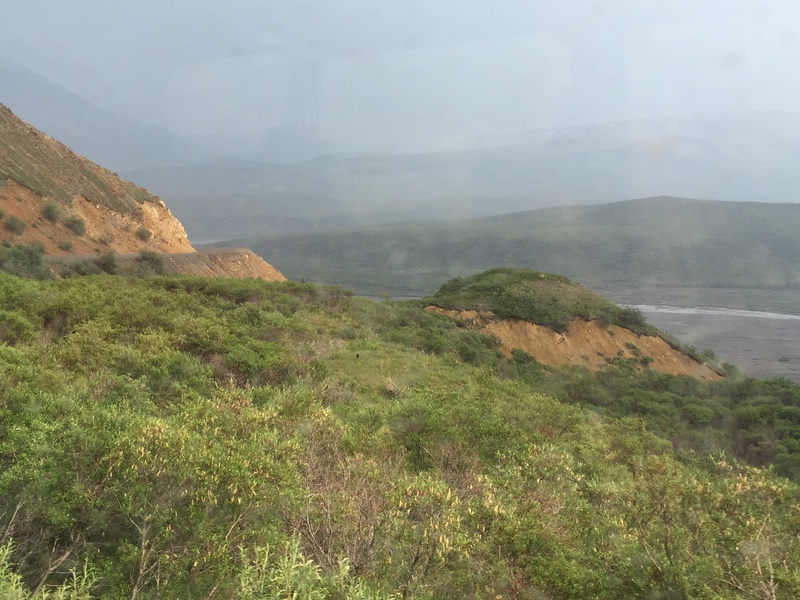 The three birding guides rotate the job of shuttling birders around the island in a bus to the cliffs, lakes, and various birding areas. 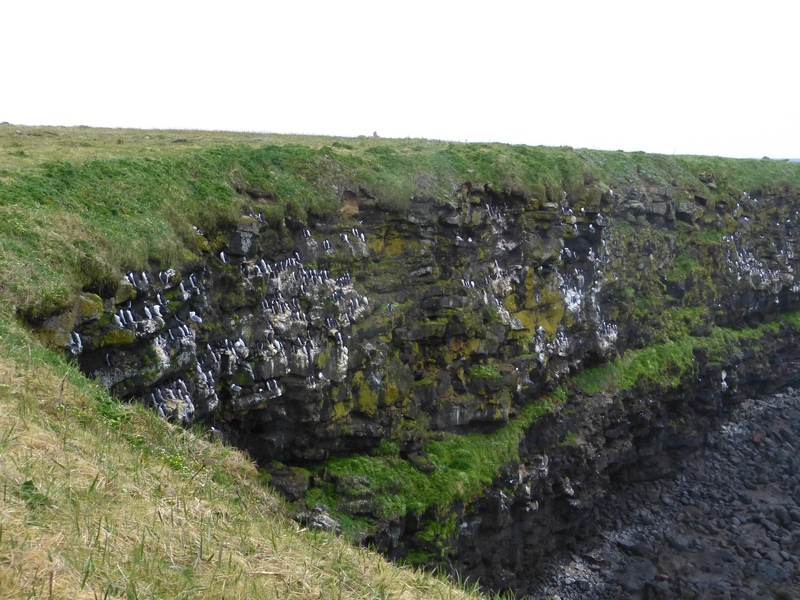 In the photo below is Ridge Wall – one of the best places to view nesting seabirds. Come in a little closer and you can see that all those white dots on the edges of the cliff are birds. 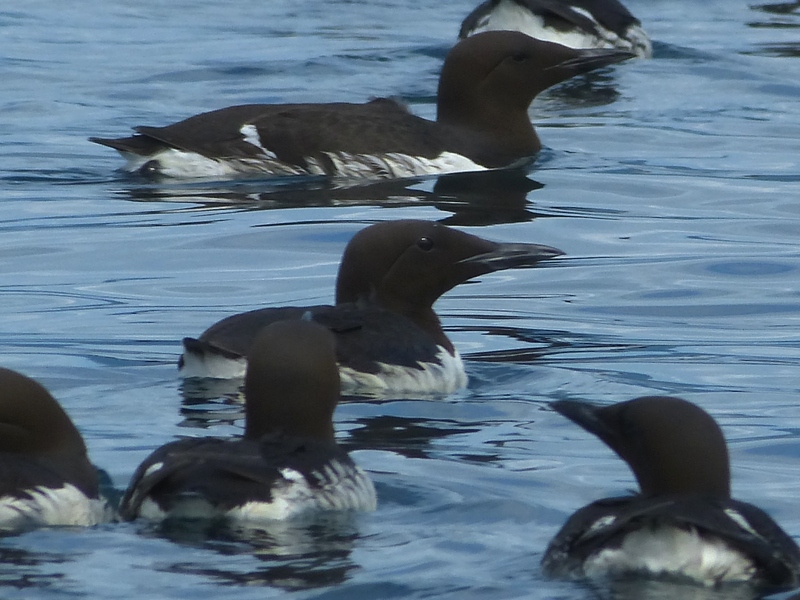 Those below are mostly Thick-billed Murres. 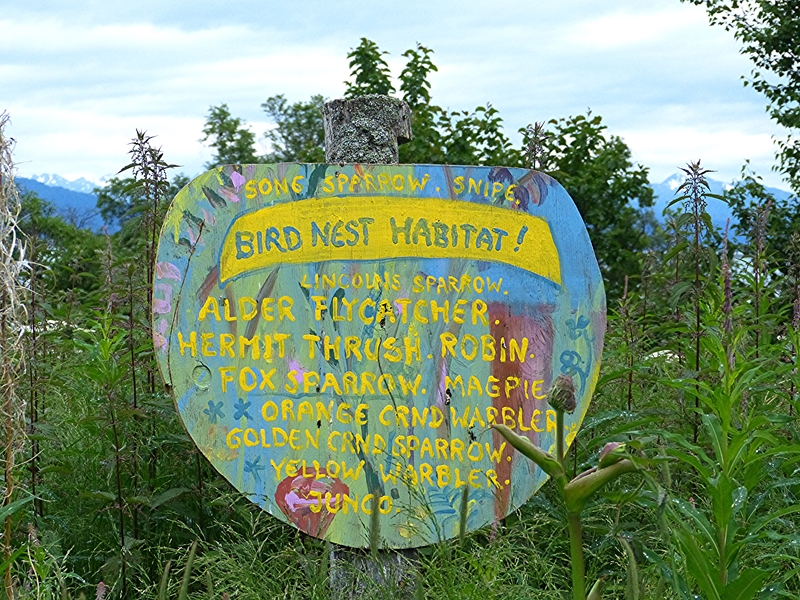 On our second full day, Scott Schuette had taken us to several birding spots around the island. Mid-afternoon, we were on our way back to the hotel for a bathroom break when Scott announced “The pit stop is cancelled. Alison just found a Hawfinch.” Hawfinch is a rare Asian visitor to the Pribilofs and it would be a life bird for most of us including Bill. 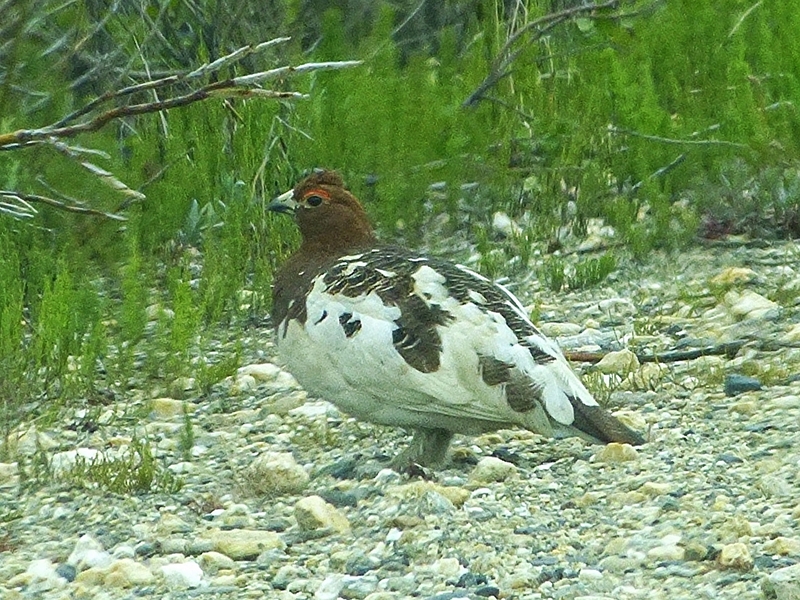 We drove as fast as the dirt roads would allow to the Tim’s Pond area in hopes of seeing this rarity. Scott stopped on the road closest to the area where Alison had seen the bird and we starting trekking over the tundra. Most of the birders in our group saw the Hawfinch as it flew overhead several times. I did not; I just couldn’t get on it in flight. But, we were lucky and finally got it in the scope when it landed on the ground. It wasn’t a great look, but one that I could count. 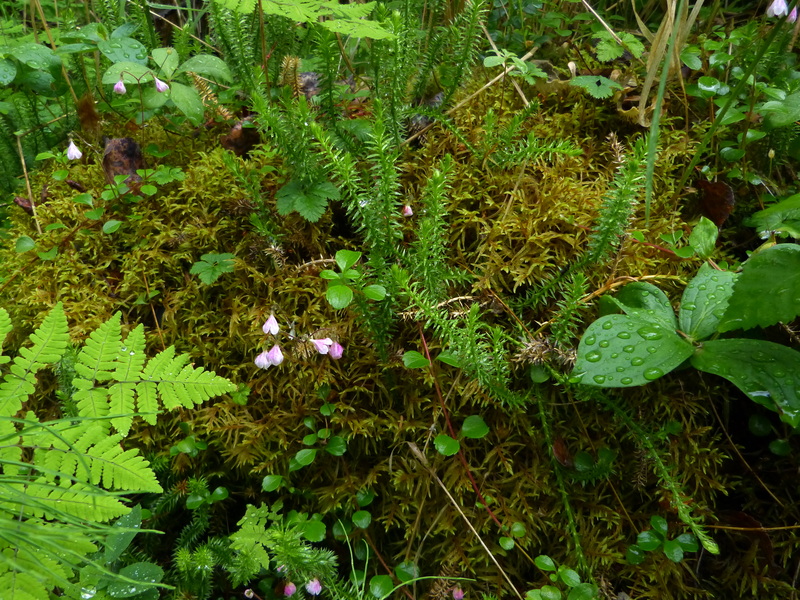 Alison tells a very interesting story about this day in her blog post, A Lifer for Bill. I was not able to get a photo of the Hawfinch, but I did get photos of some nesting seabirds. 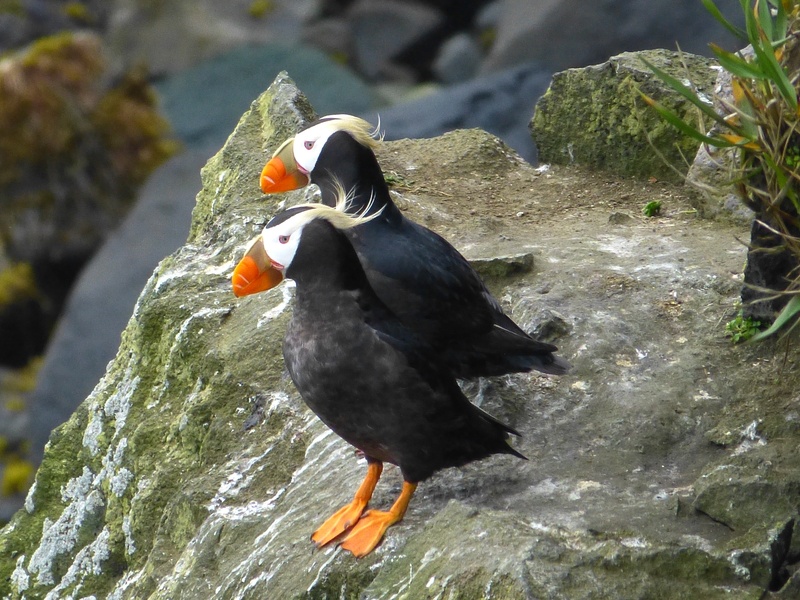 What could be cuter than this pair of Tufted Puffins? 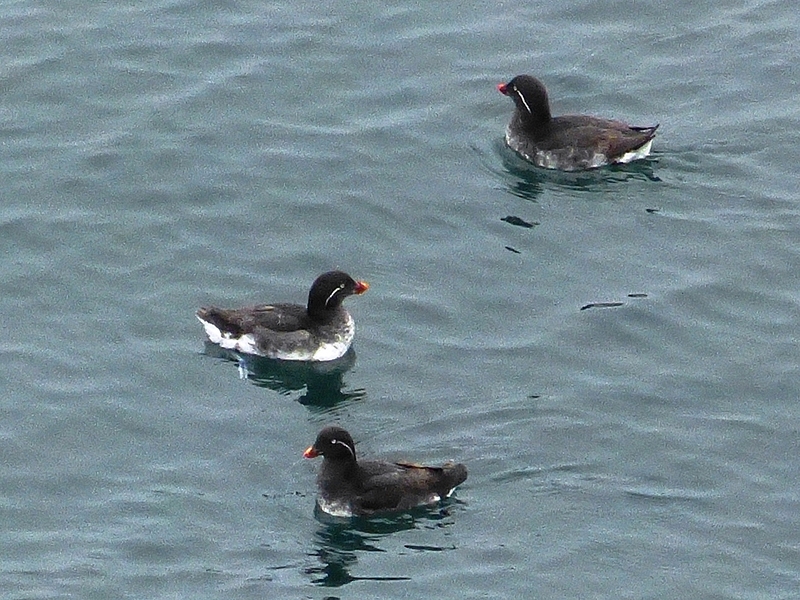 Least Auklets are pretty cute, too. 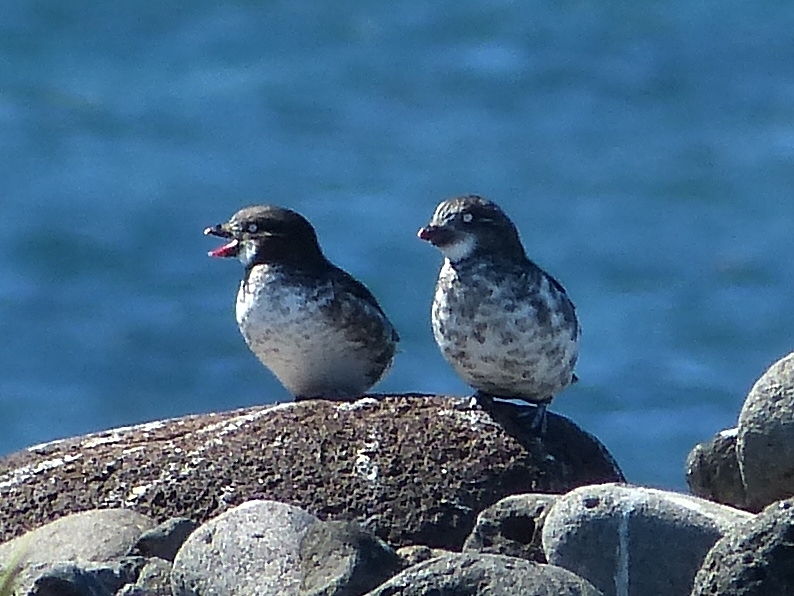 Two other species of auklets nest on the island, the Parakeet Auklets shown in the photo below and Crested Auklets. We saw all three species. 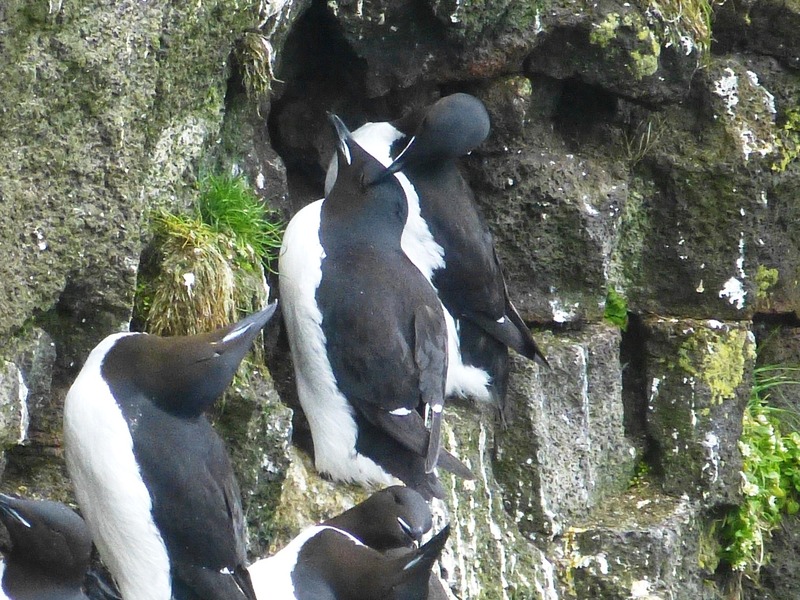 And, here are those Thick-billed Murres again, really close-up. 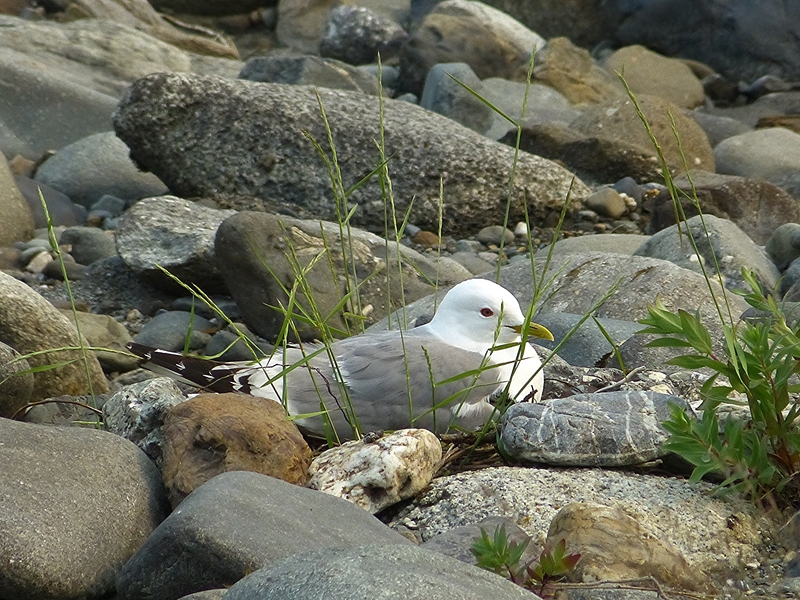 This is the most common nesting seabird on St. Paul Island. 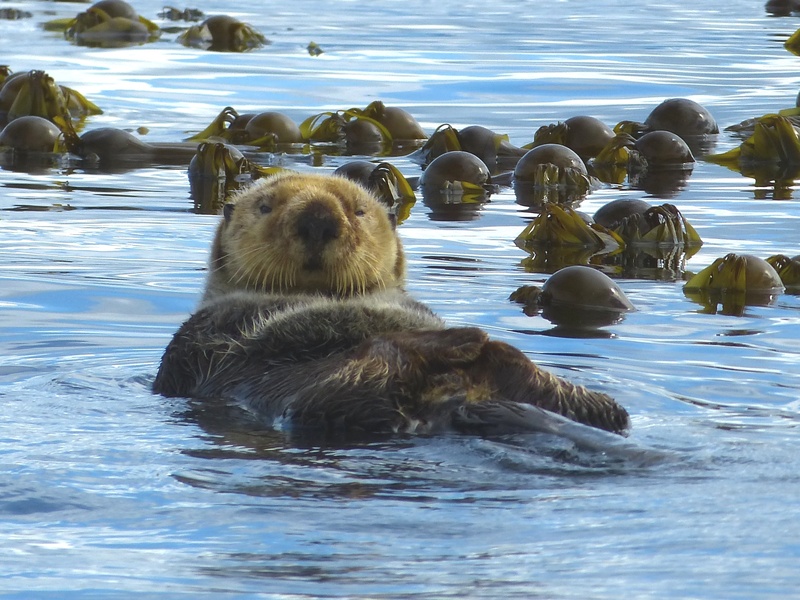 St. Paul is the largest of the Pribilof Islands with a total area of 43 square miles. The typical temperature in June is in the low 40s and the high wind and humidity give the summer air a raw chilliness. 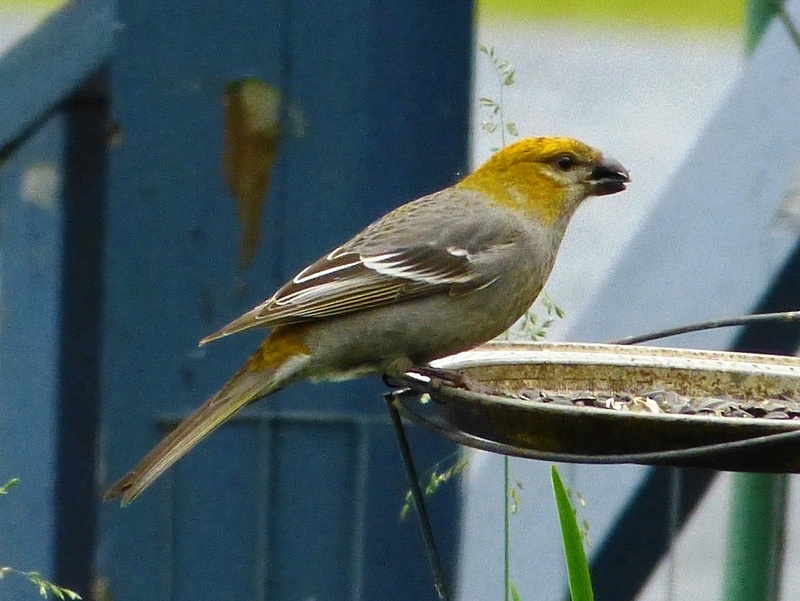 Amazingly, three small songbirds are year-round residents in this harsh climate of St. Paul Island – Winter Wren, Gray-crowned Rosy-Finch, and Snow Bunting. 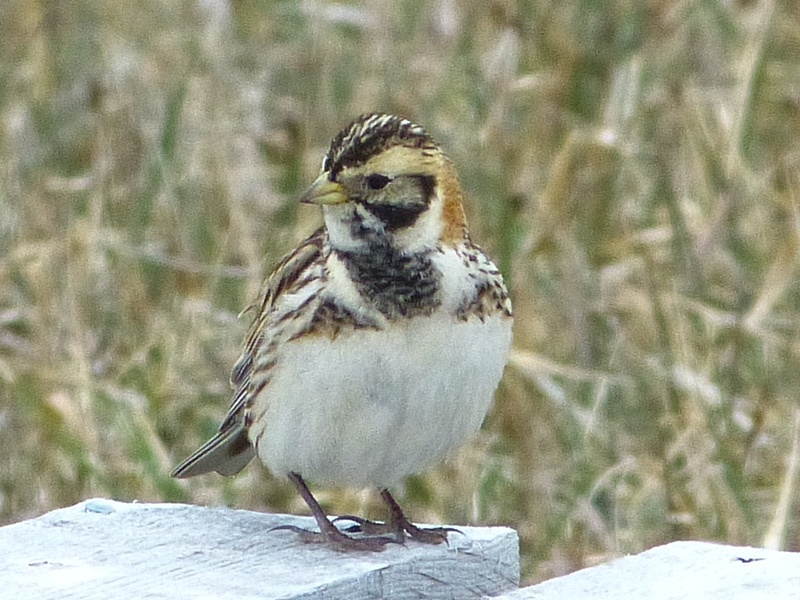 One additional songbird joins them for the breeding season – Lapland Longspur. 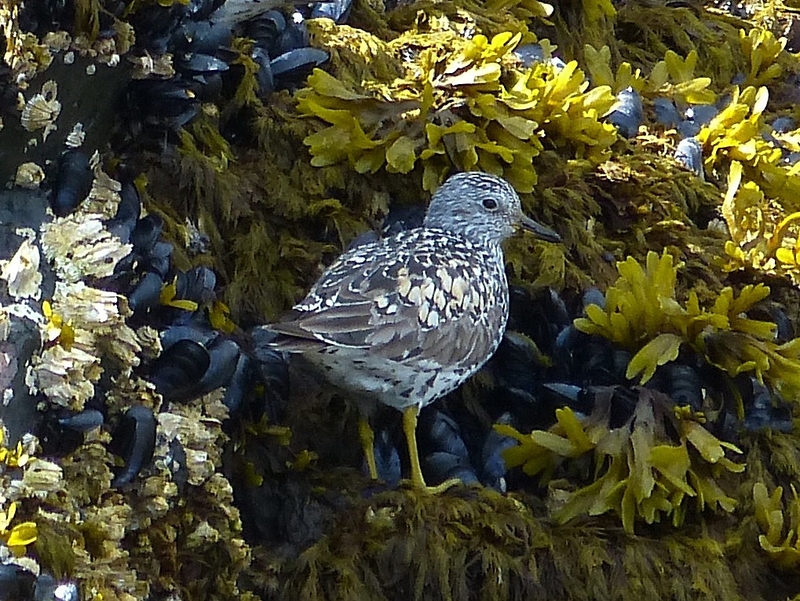 The other avian life on the island consists of mostly seabirds, ducks, and shorebirds. The landscape is marine tundra; there are no trees. 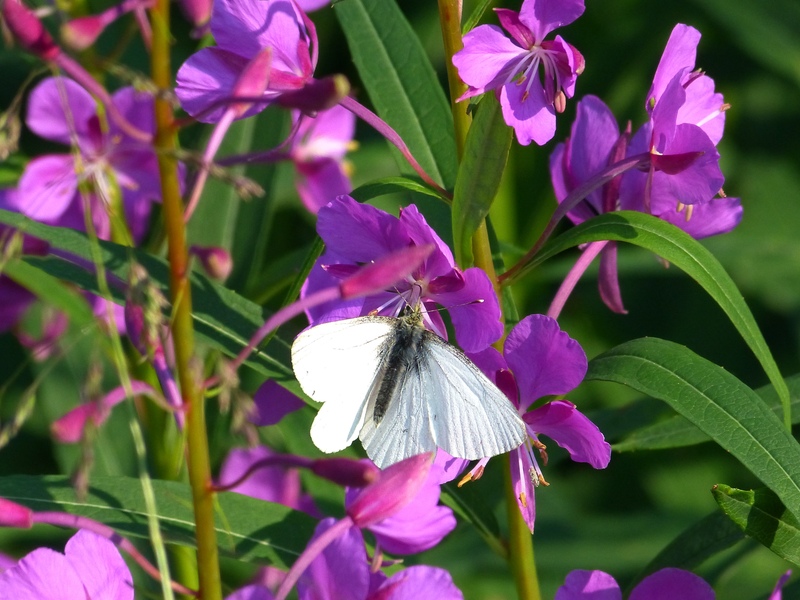 Arctic Lupine and Wild Celery grow all over the island. 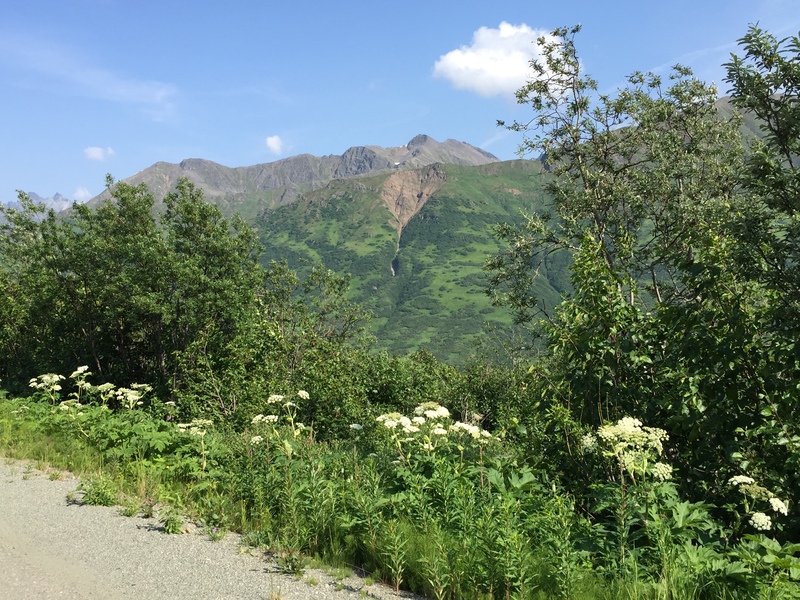 Despite its name, the Wild Celery in Alaska bears no resemblance to the edible vegetable celery, although it is a valuable food for wildlife. 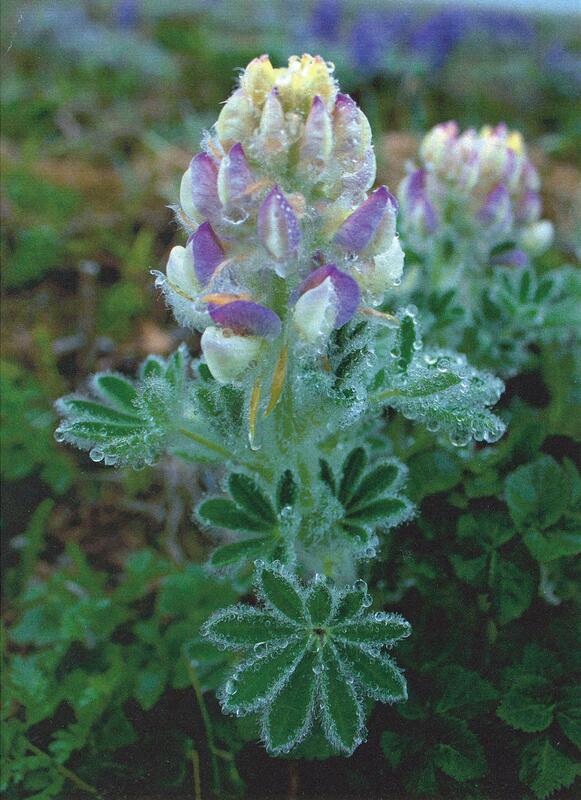 The image to the left is a postcard that depicts the lupine exactly like it looked most mornings on St. Paul. 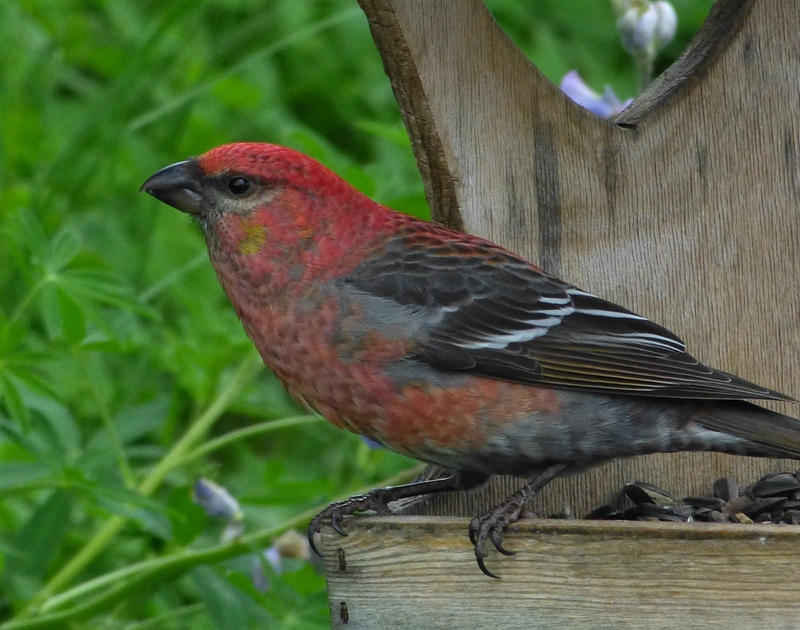 The Rosy-Finches were one of my favorite species of the entire trip. And, how their looks change with just a little puffing up and a different perspectve! 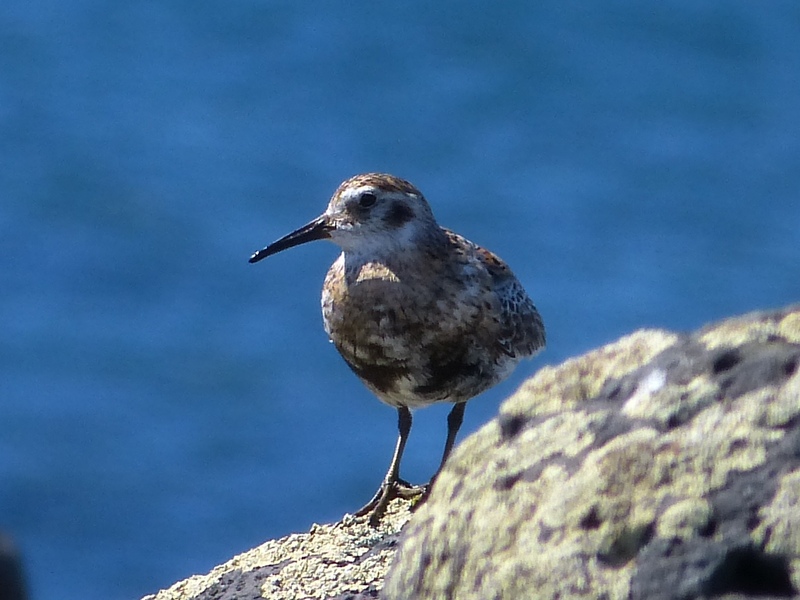 The Rock Sandpipers were another of my favorite St. Paul Island breeding birds. One afternoon, I enjoyed some time with Red-necked Phalaropes at a little pond while the others trekked further out over the tundra. 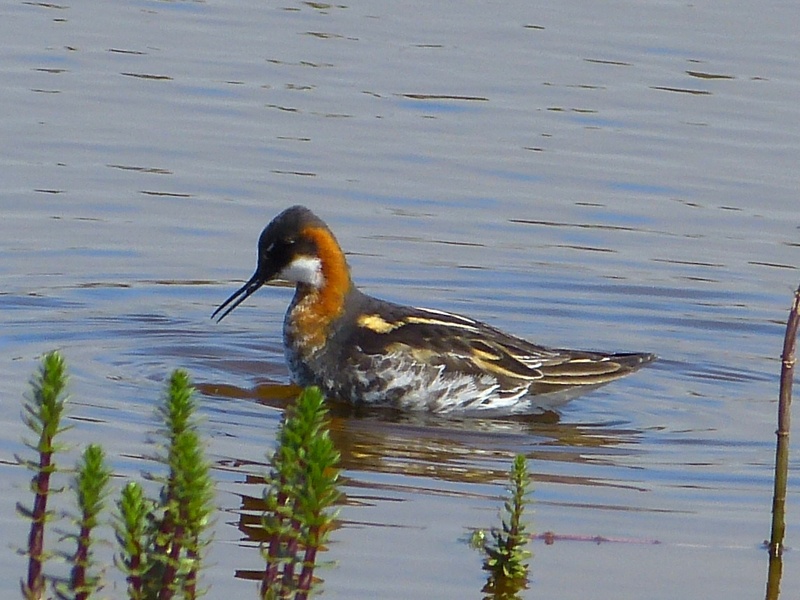 Phalaropes are fascinating birds. 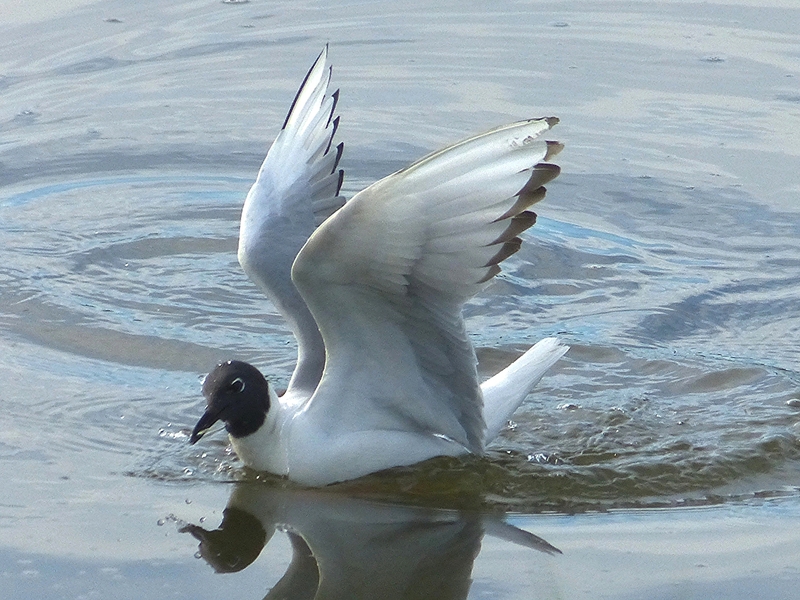 They are known for spinning in circles to flush small aquatic prey to the water’s surface where they can easily pluck it with their bills. Also, phalaropes exhibit what scientists call “reverse sexual dimorphism” which simply means that the girls are prettier than the boys. 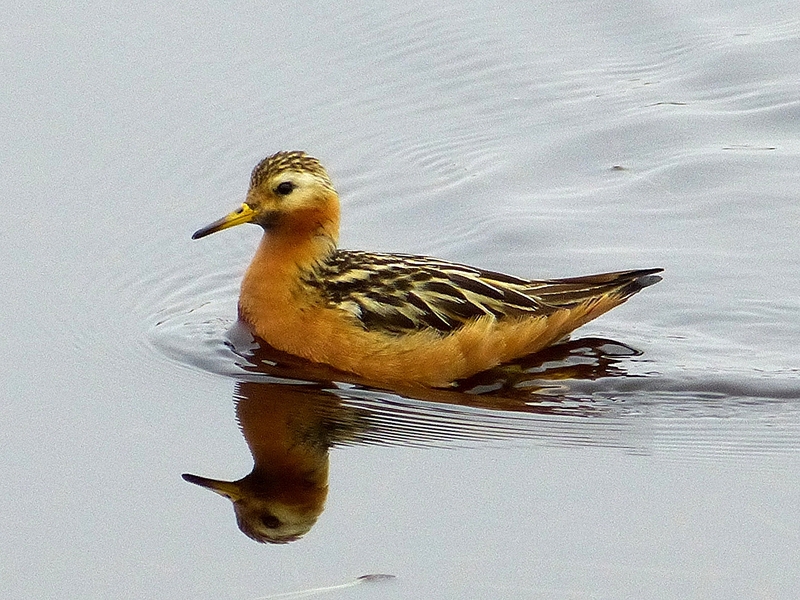 The typical courtship and parental roles are also reversed in phalaropes. Females fight ferociously over males. After they are paired up, the male builds a simple nest in which the female lays four eggs. 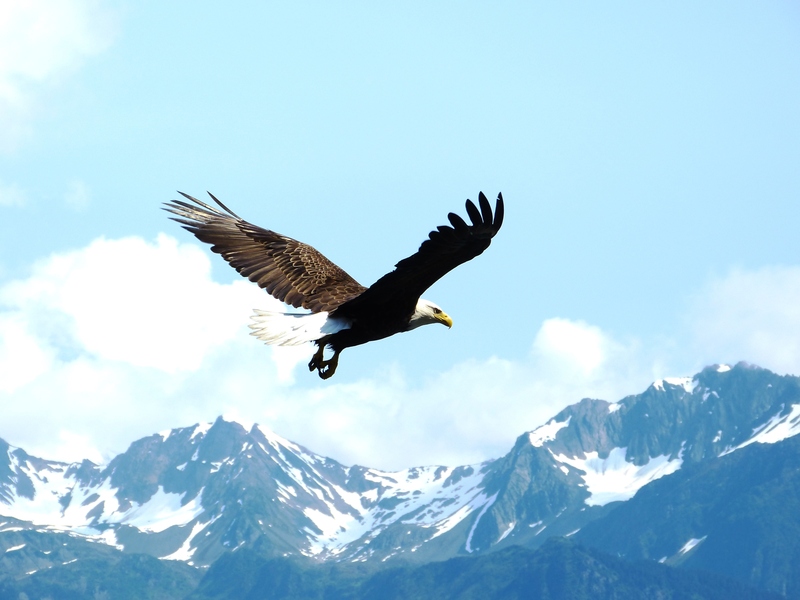 And, then she flies away leaving the male to incubate the eggs and tend to the chicks after they hatch. 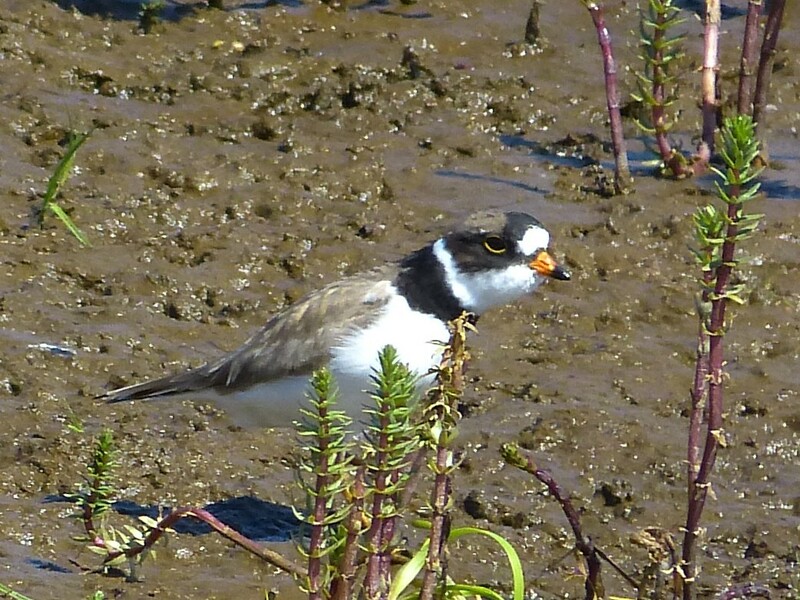 Several other birds bounced around the edges of the little pond with the phalaropes, including Semipalmated Plovers. 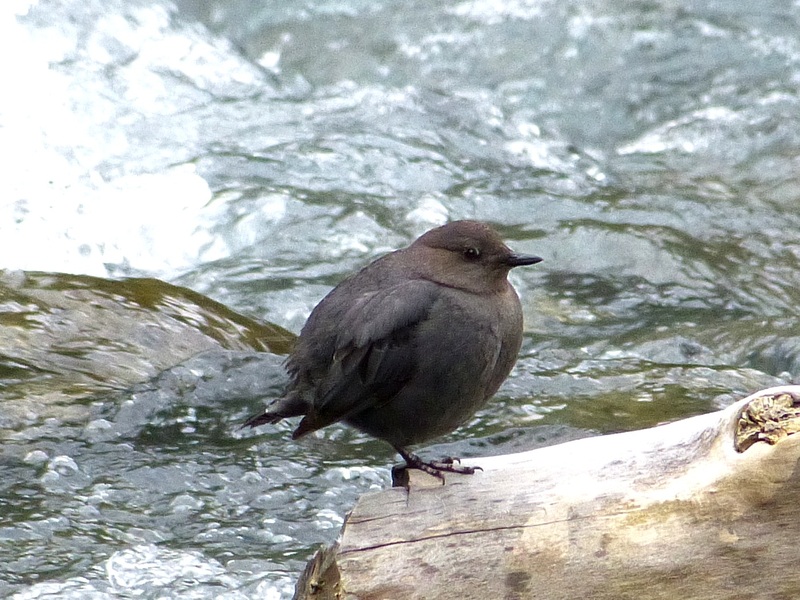 This species is familiar to most birders due to its wide wintering range, including the southern part the U.S. mainland coasts, but it breeds in Alaska and northern Canada. 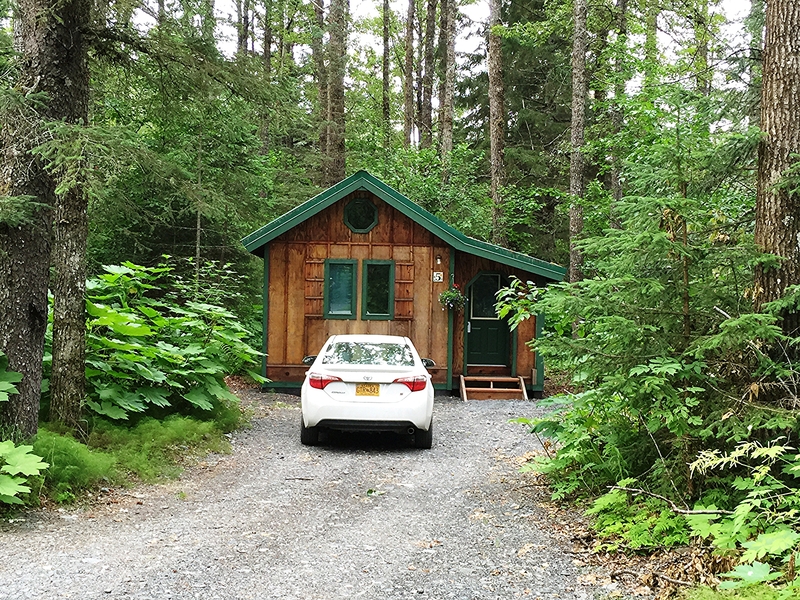 Our four day/three night stay on St. Paul Island was over all too quickly. 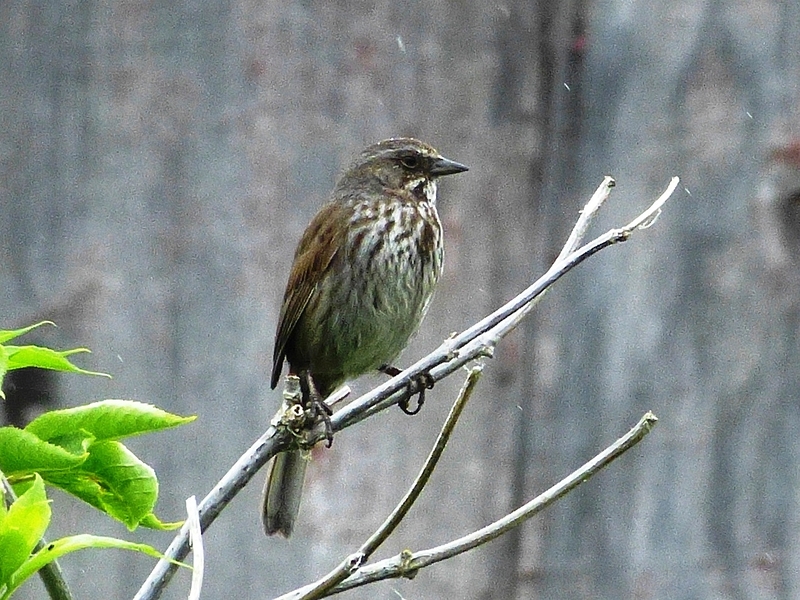 All three of our birding guides, Scott Schuette, Cory Gregory, and Alison Vilag, were excellent birders and took great efforts to ensure that we saw all the birds on the island and had good looks at everything. We couldn’t have asked for more, except maybe to go back again! 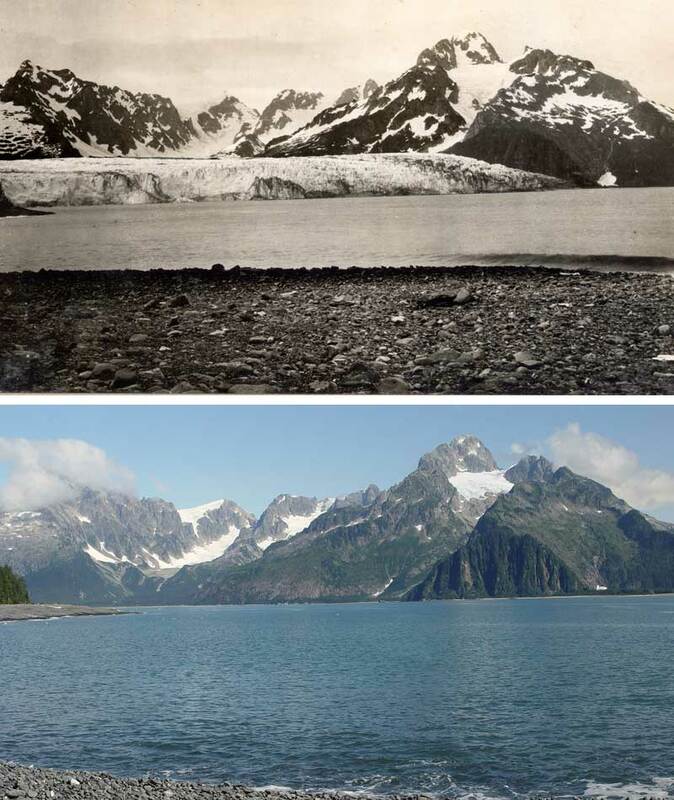 I don’t remember a time that I didn’t want to visit Alaska. 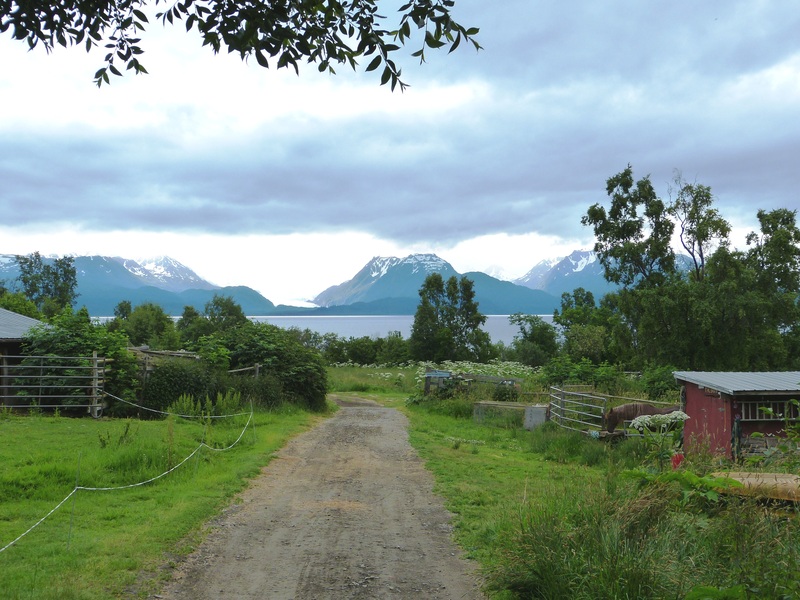 It’s a big expensive trip, though, so it had not risen to top of my travel plans until Bill Drummond wrote last year inviting me to go on his 23rd and last trip to Alaska. 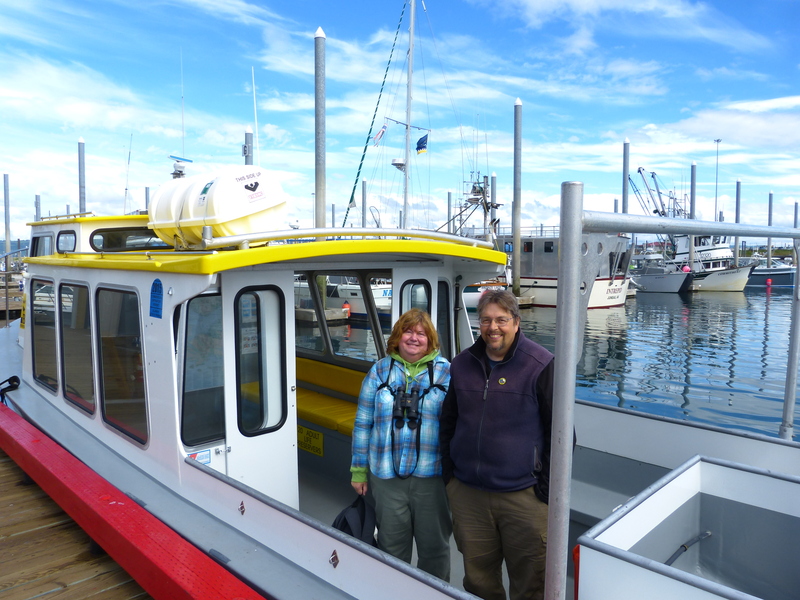 I wanted to go with Bill because of his extensive experience in Alaska, so I signed up for the 3-week birding trip. And, I would have a bonus. My friend, Diane, wanted to go on the trip, but could not get the time off from work, so we decided that I would stay another week after Bill’s trip and she would fly out to meet me. 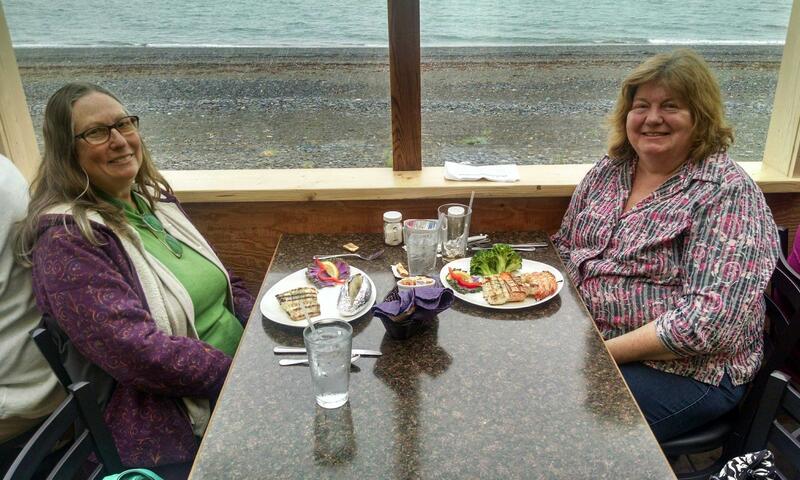 The two of us would spend a week on the Kenai Peninsula. 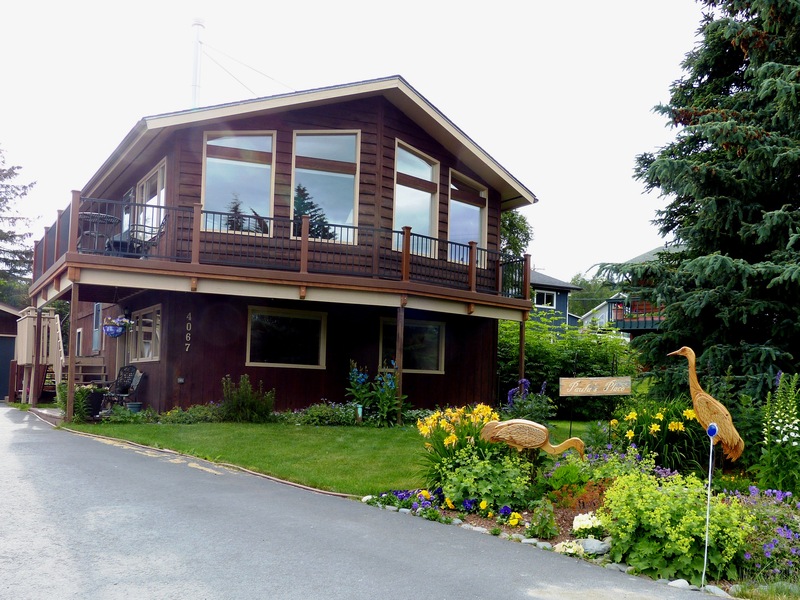 Nearly a year after committing to the trip, I flew to Anchorage on June 7. The next morning I flew to Nome to meet Bill, co-leader Dave Hursh, and the rest of our group. Nome was much smaller than I’d expected with a population under 4,000. 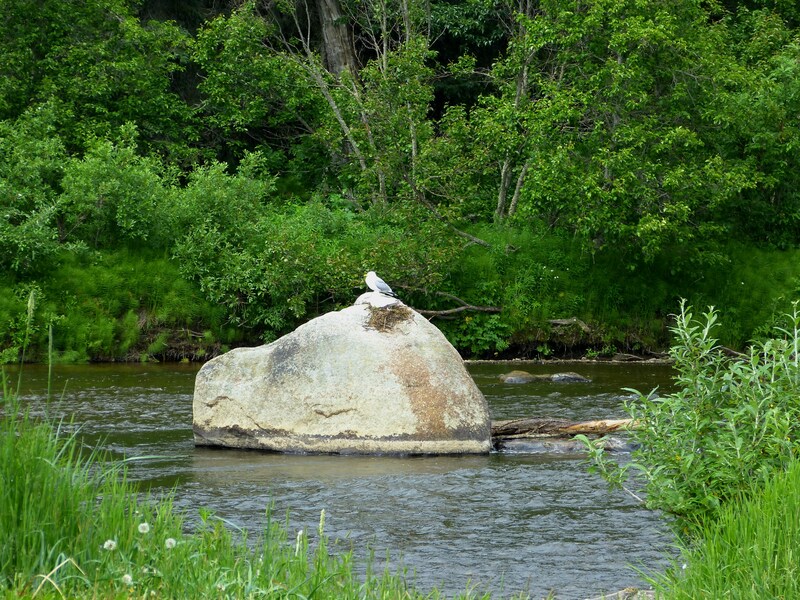 It seemed that all the visitors to the town were birders, some with organized groups and some on their own. There are three main roads leading out from Nome, each about 75 miles long, but no roads or railways connect Nome to other major Alaskan cities. 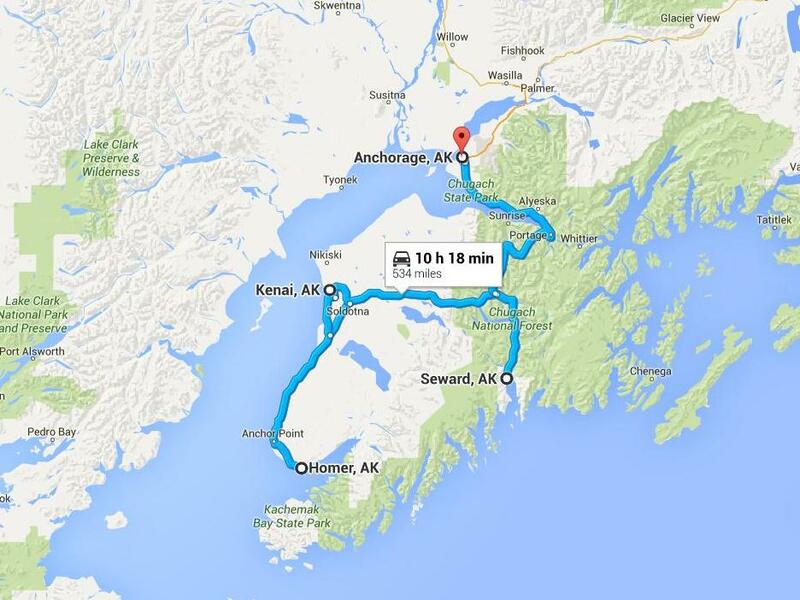 Birding in Nome consists of driving these three roads. 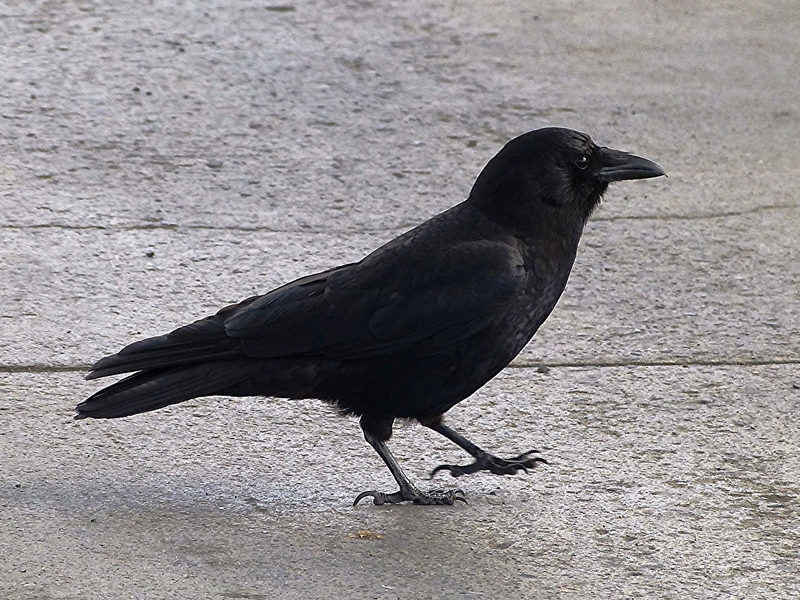 Birds are spread out in breeding season, with large groups only along the coast of the Bering Sea. 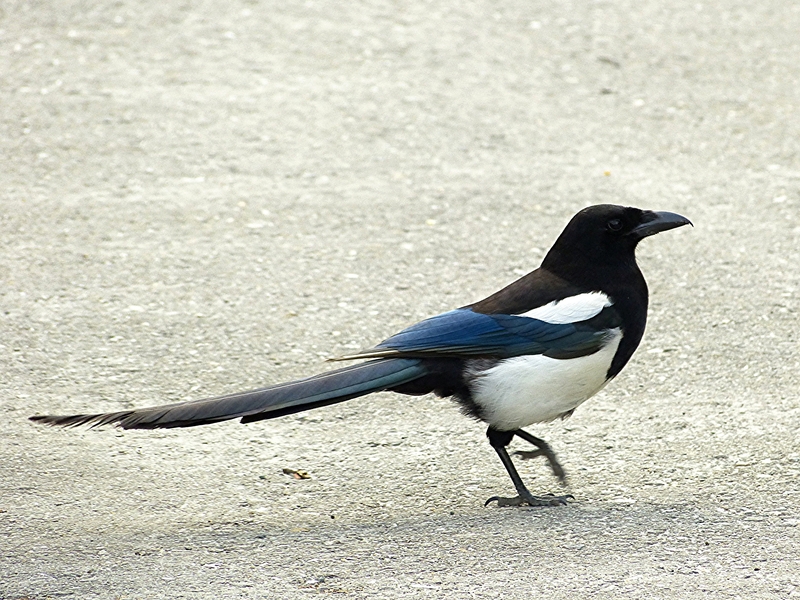 The appeal to birders isn’t numbers, though, but birds that are found nowhere else. The avian star of Nome is the Bristle-thighed Curlew (click link for fantastic photo and info), a shorebird that looks a lot like a Whimbrel. 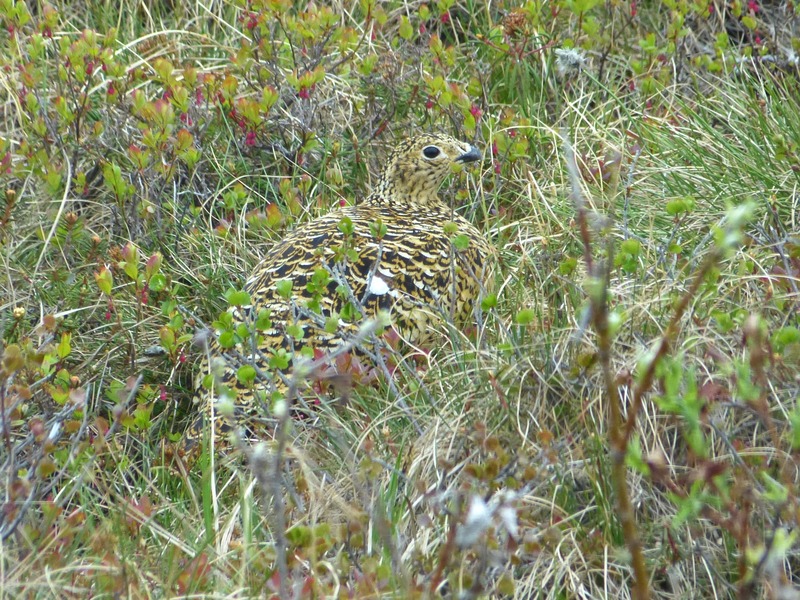 This rare bird with a population well under 10,000 is known to breed only on inland tundra in the steep hills of western Alaska. Nests are frequently placed directly beneath dwarf willow shrubs. Two sites near Nome are the only places where birders can see the curlew on its breeding grounds. 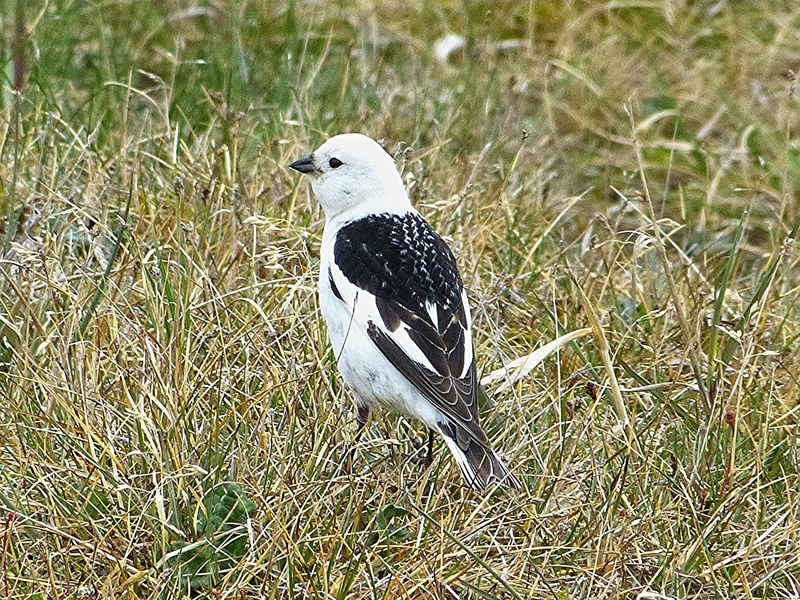 On our first full day in Nome, June 9, our goal was to see this bird, Bill’s favorite. We choose the easier site, at mile 72 on Kougarok Road, as most birders do, but it still took several hours to climb the hill on the spongy and uneven tundra. 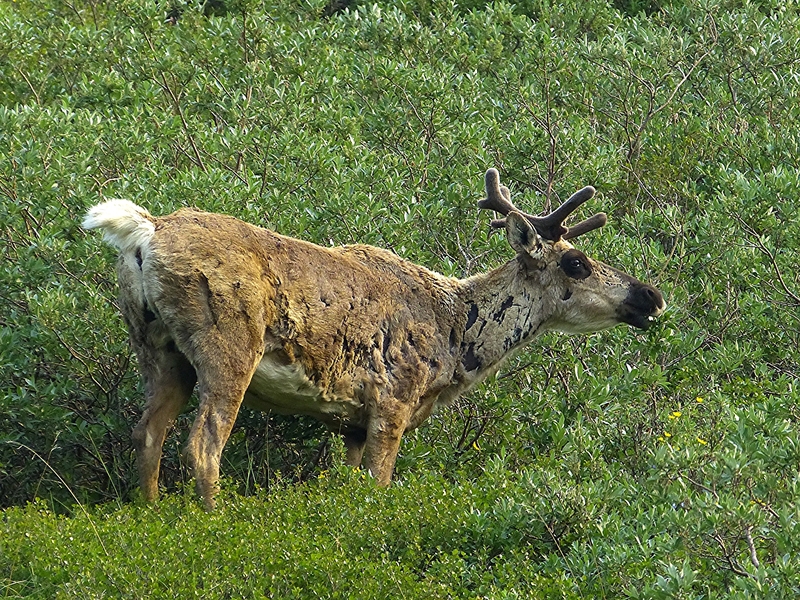 There were interesting sights on our way up the hill, though – tiny tundra flowers, nesting Long-tailed Jaegers, Willow Ptarmigan. I did not get the close look at the curlews that I’d hoped for, but just as exciting was a bird that flew directly overhead uttering its distinctive call. 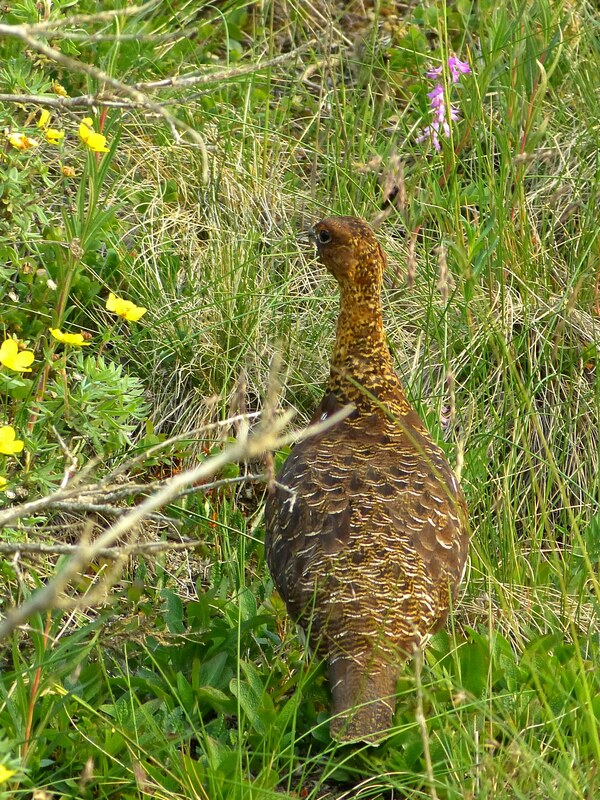 A female Willow Ptarmigan, part way up the hill to the curlews. 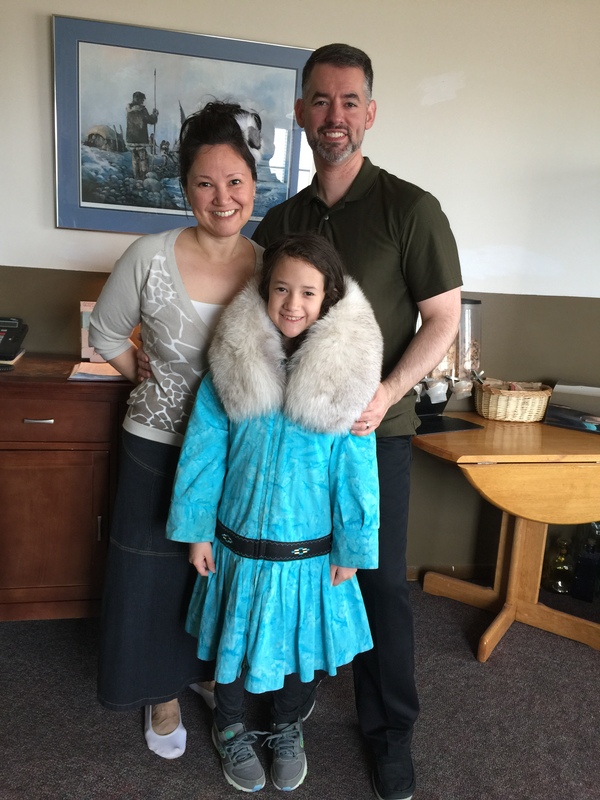 On June 10, we spent the day closer to Nome where we found Musk Oxen not far from town. As rough looking as they are, underneath that tangled mess is an undercoat of fine wool that is eight times warmer than sheep wool and softer than cashmere. 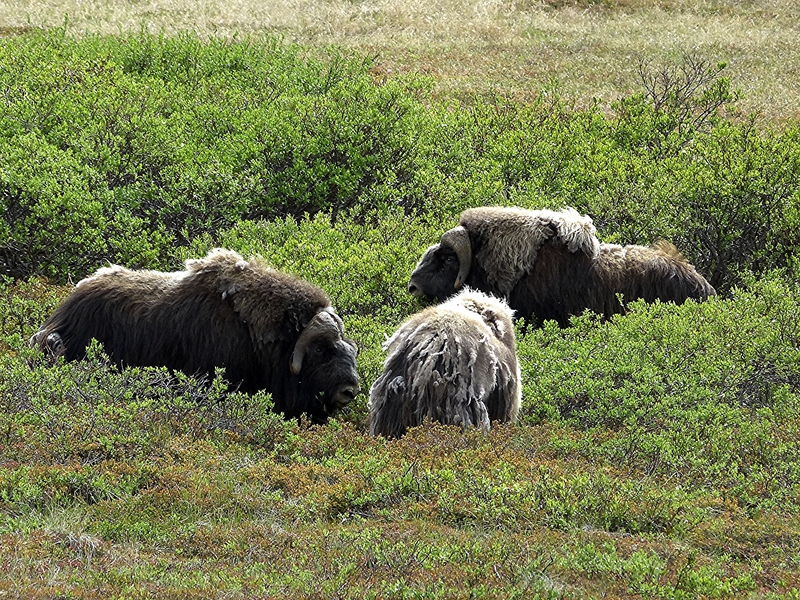 Musk Ox are not sheared; the fine wool is collected by hand combing or picking from bushes the animals rub against during molt. As you can guess, it is highly prized and very expensive. 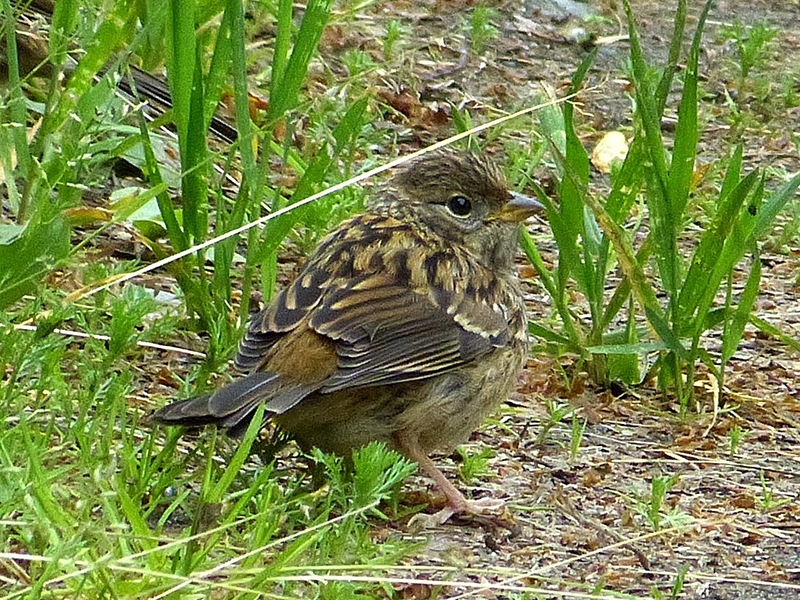 Lapland Longspurs are common breeding birds in Alaska. 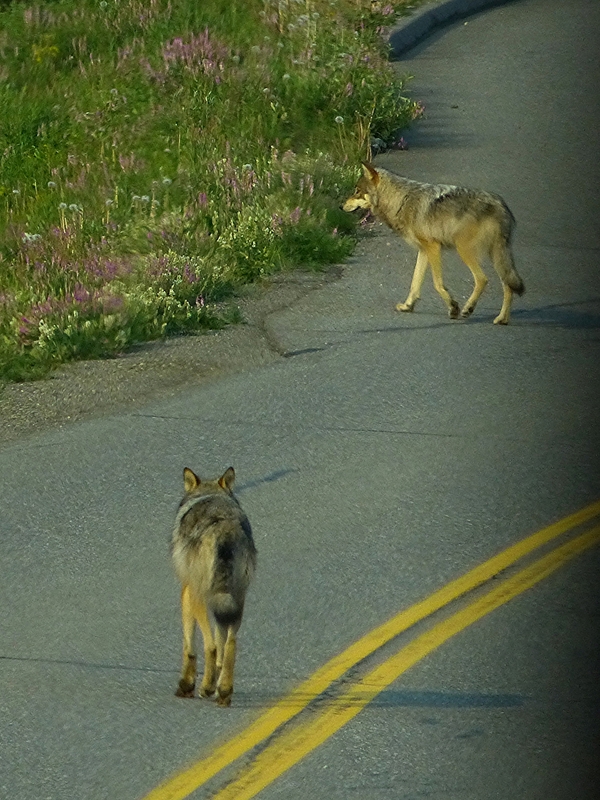 We saw them everywhere except around Anchorage and on the Kenai Peninsula. We drove to Teller on June 11. 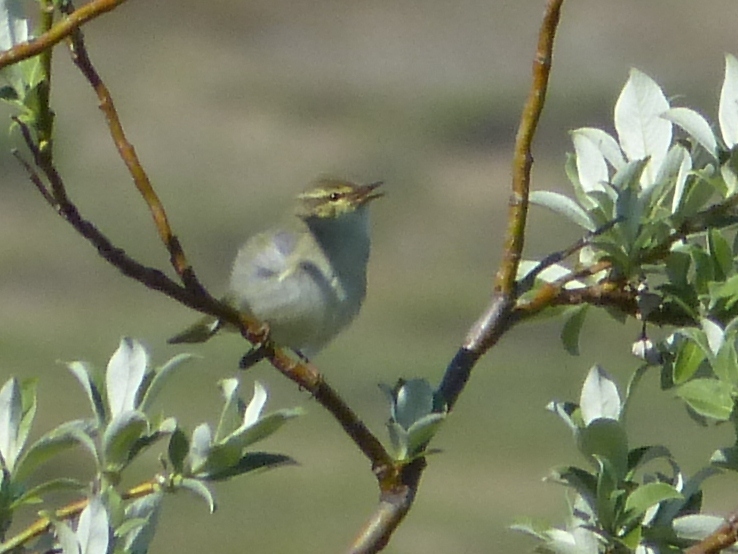 One of our target birds was Arctic Warbler, a regular breeder near Nome. 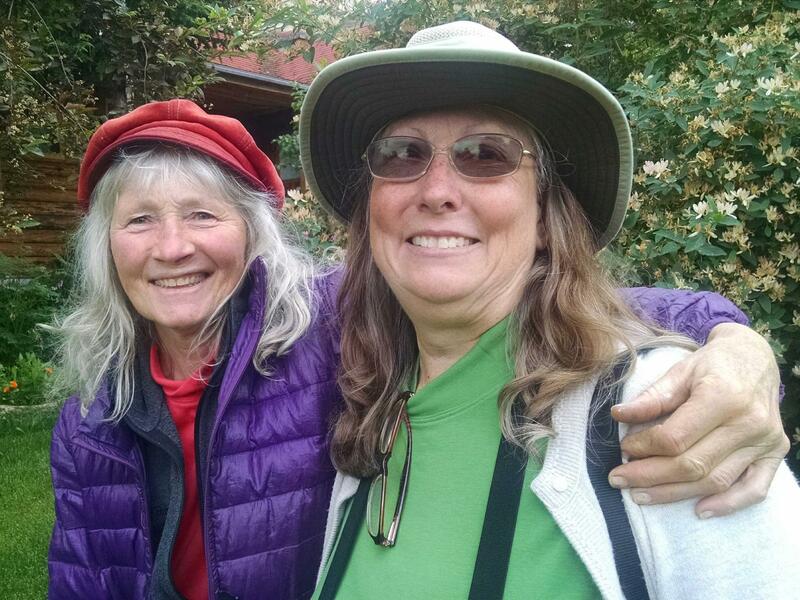 Our caravan of cars carrying our 22 birders stayed in close contact via 2-way radios. This day, I was riding in the same car with Bill. When we reached an area with willows where we expected to find the warblers, the others started down a side road. Bill said, “We usually see them right here,” so our car stopped and we got out. Immediately, I heard Pete say “I’m on it” and my binoculars were soon on it, too. Everyone else came to where we were and all had good views. Another pleasant stop that day was at the bridge over the Sinuk River. 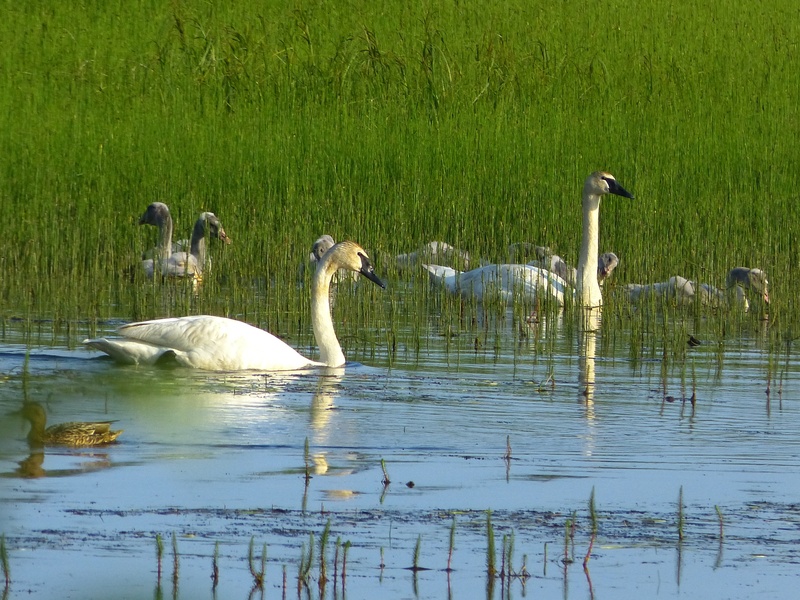 It was a gorgeous day and some beautiful birds cooperated for photographs. 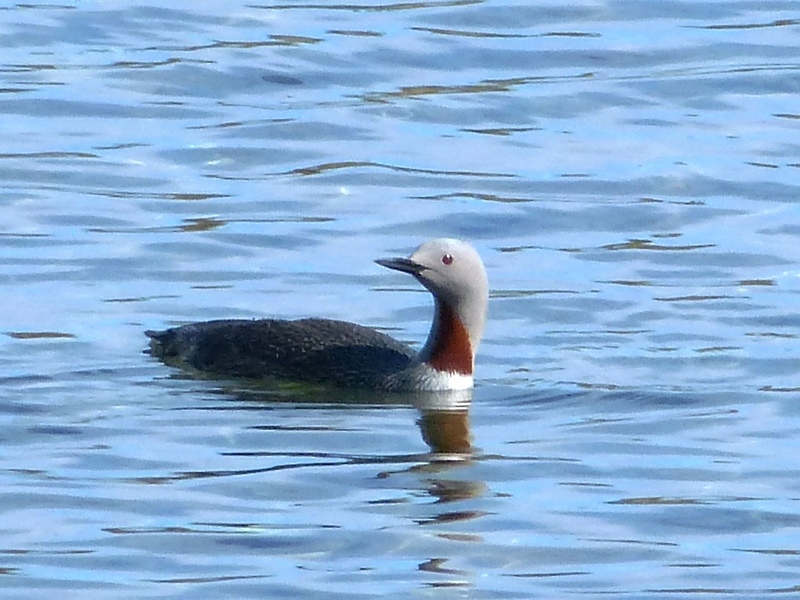 I had seen Red-throated Loons before – in winter. Seeing their glowing red throats in breeding plumage was almost like getting a life bird. The lovely and amazing Arctic Terns really were life birds. They have the longest annual migration of any animal on earth. 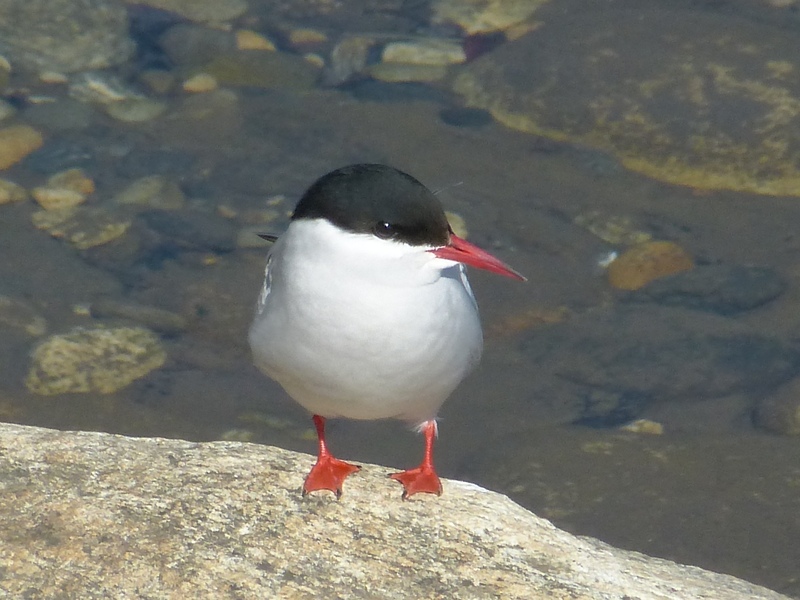 Recent studies that placed geolocators on Arctic Terns discovered that their zigzag flights between their tundra breeding grounds and their wintering grounds off of Antarctica average 44,000 miles annually! 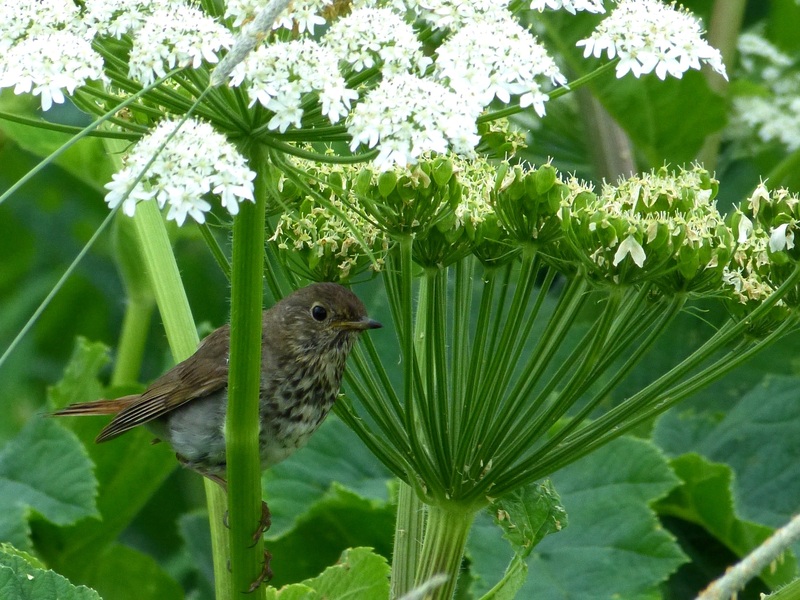 We spent most of June 12th birding the first 20 miles of the Council Road between Nome and Safety Sound. 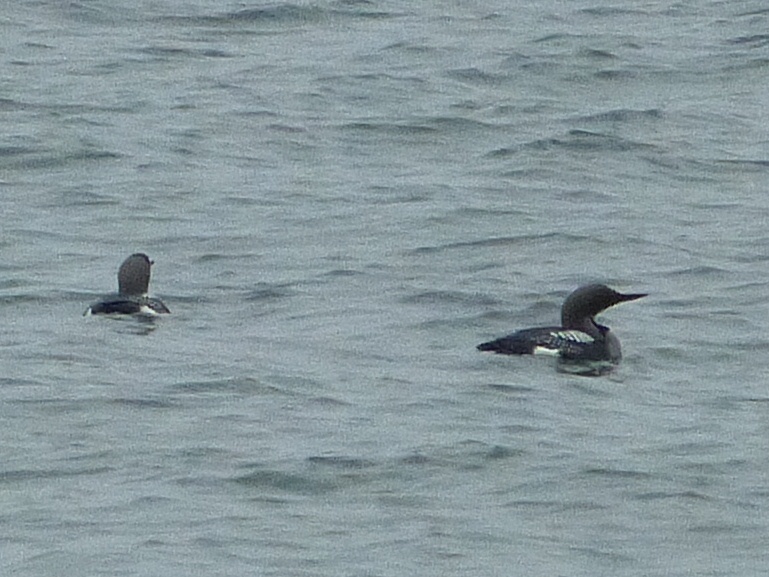 We were lucky to see another of our targets, Arctic Loon. 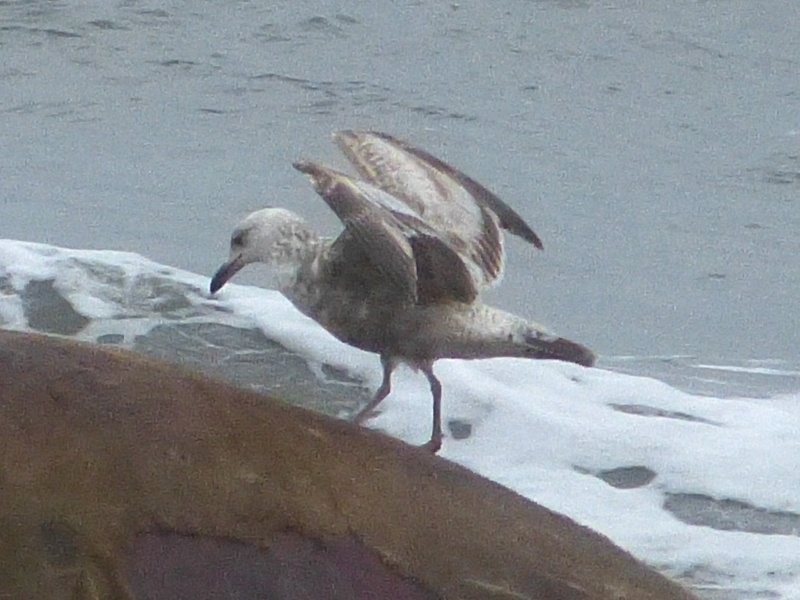 We found two birds close to shore and I was able to get a photo before we watched them swim farther out into the sea. 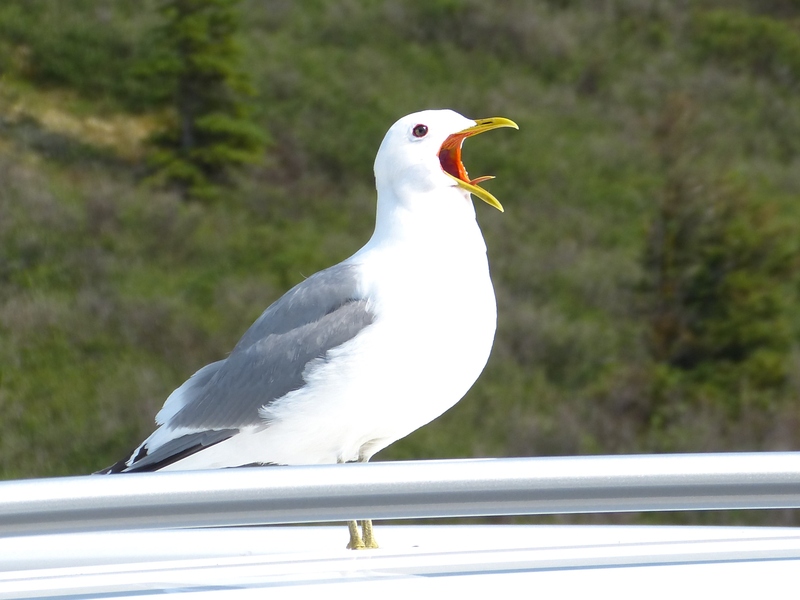 As expected, we saw lots of gulls along the coast. 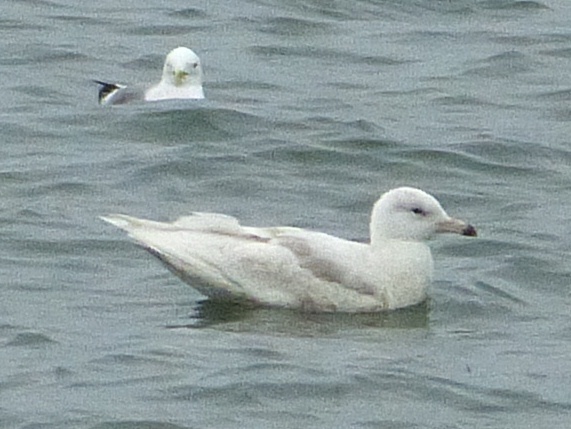 Glaucous Gulls were common in Nome. 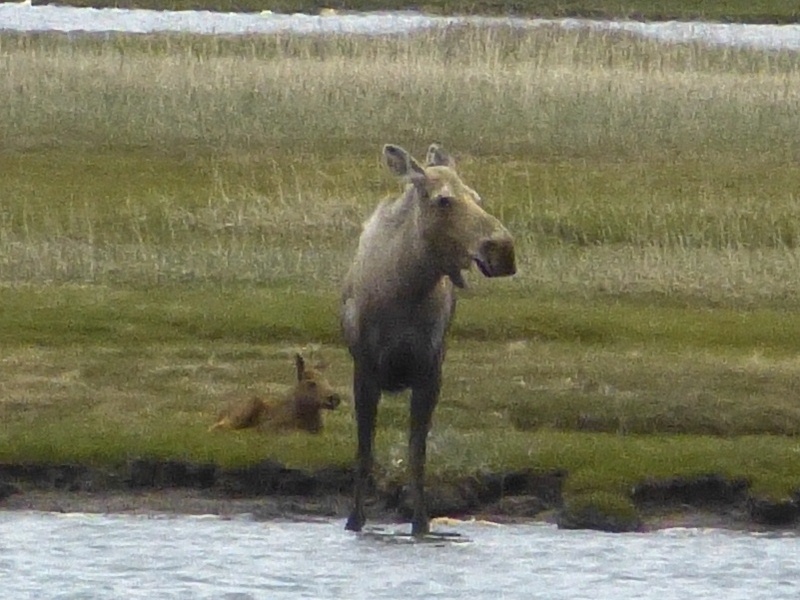 Another fun sighting was not a bird, but a female Moose who had just given birth on the opposite side of the river along the road. 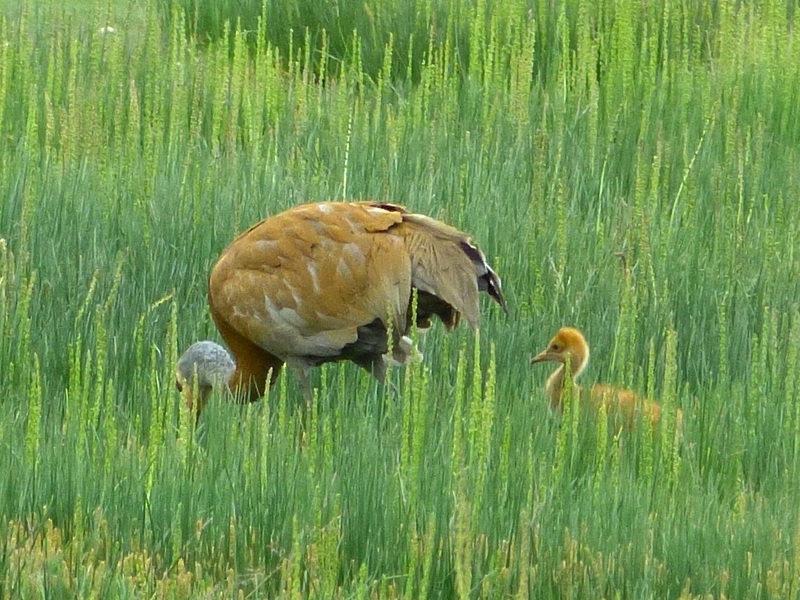 The first group to arrive saw the baby stand on wobbly legs and nurse. 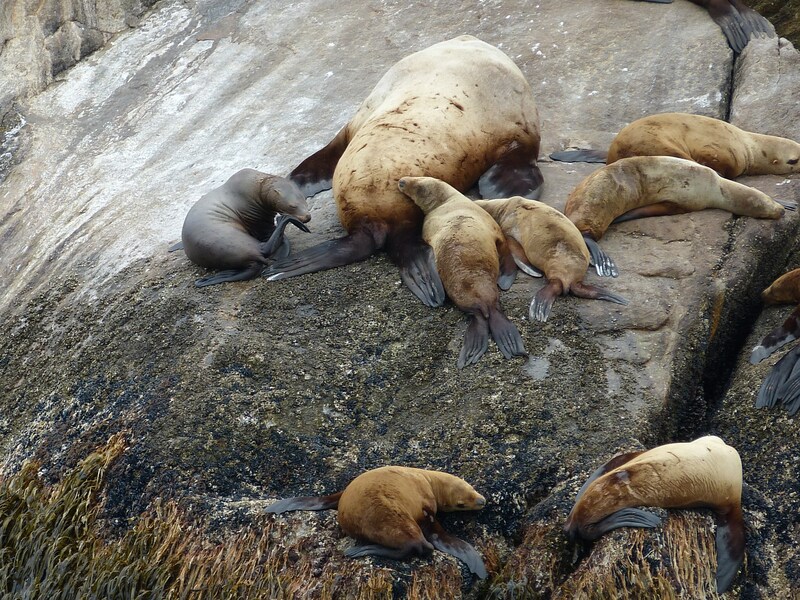 By the time that I got there, the baby had lain down close to mom. 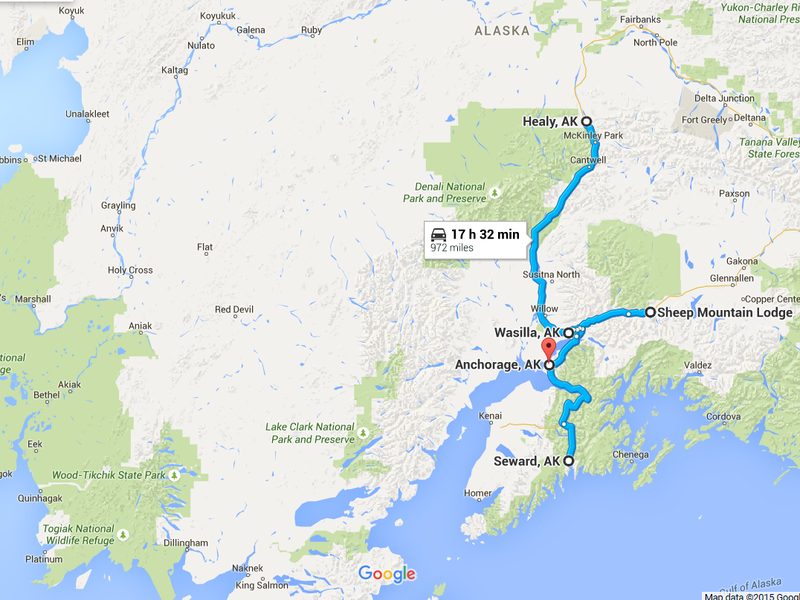 The next day we flew back to Anchorage, but not before a little more birding along the coast. 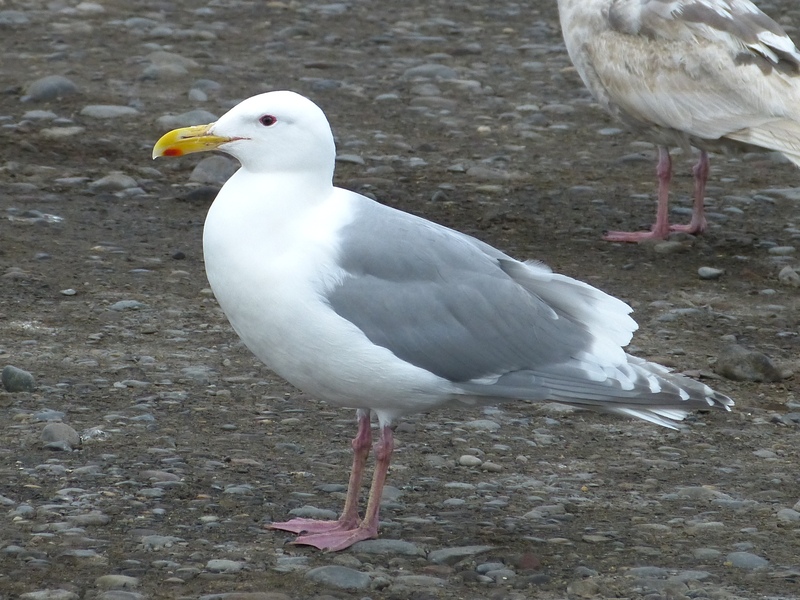 We had good looks at a first summer Slaty-backed Gull feeding with other gulls on the washed-up carcass of a walrus. Back in Anchorage that afternoon, we had time to check out Lake Hood right behind the Coast International Hotel where we were staying. 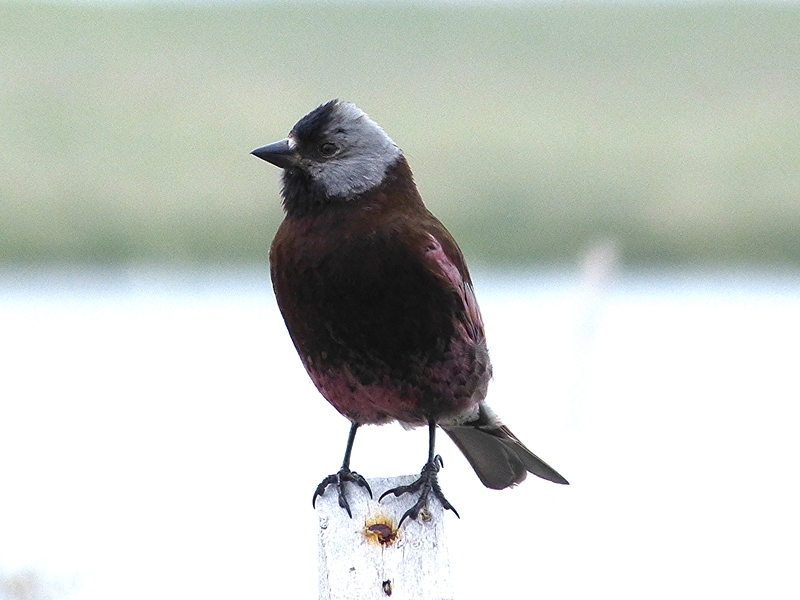 Lake Hood is the busiest seaplane base in the world, so I was surprised to see birds there at all. But, apparently they love this lake, so much so that they have been a continuous problem there. In an effort to reduce Lake Hood’s bird population in the early 1990s, officials released three female pigs named Larry, Curly, and Moe on the island that separates the takeoff and taxi lanes. The plan was for the pigs to rototill nest spots and eat eggs that the birds managed to lay. The pigs were effective for a while, but the effort ultimately failed. 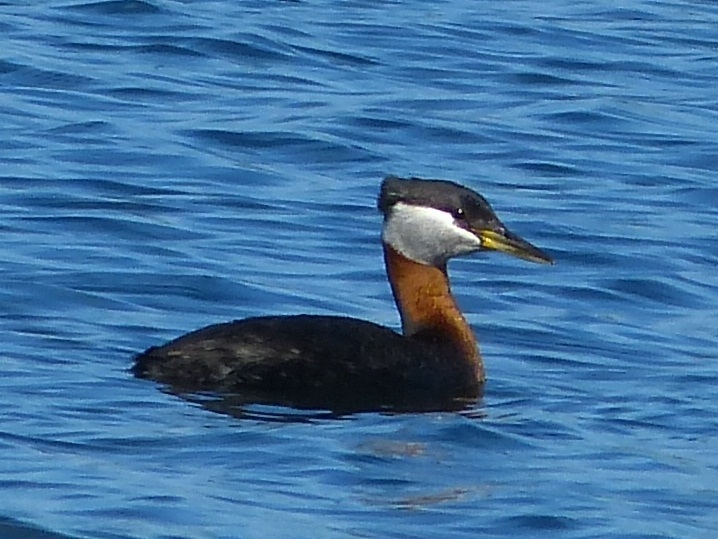 There are no longer pigs at Lake Hood, but birds remain, including beautiful Red-necked Grebes. 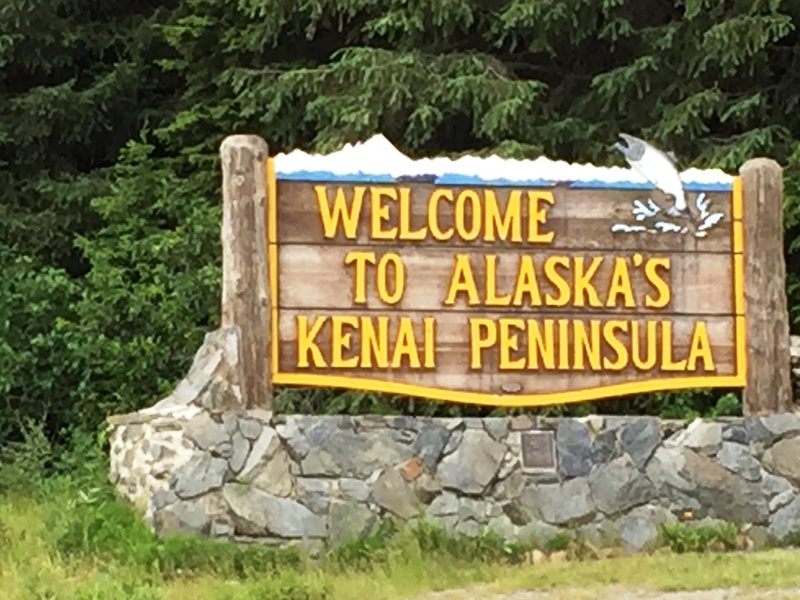 This is just part one of my month-long Alaska adventure. Stay tuned for more!